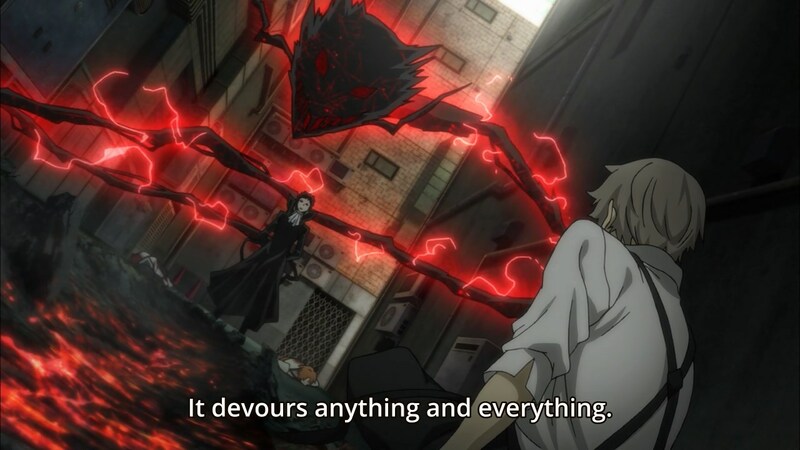 Bungou Stray Dogs Final Episode (12): The raid bosses appear! Right at the end! What’s up, roomie? Nothing strange going on here…moving on. Wait…plot development? We’re not ending the season off with a filler episode? Woohoo! Well, I guess I actually have to pay attention now. That’s some convenient helicopter timing. 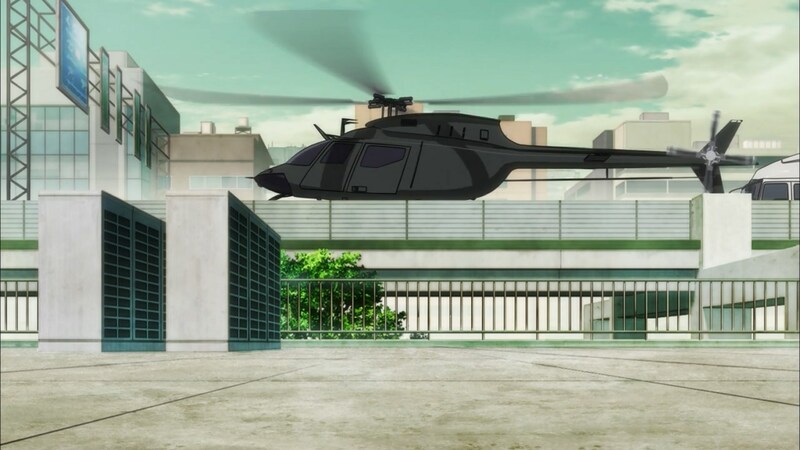 Also, is he landing his helicopter in the middle of the highway despite the fact that there seems to be a decent landing area right next to it? Aww man…now I can’t complain about his helicopter placement. 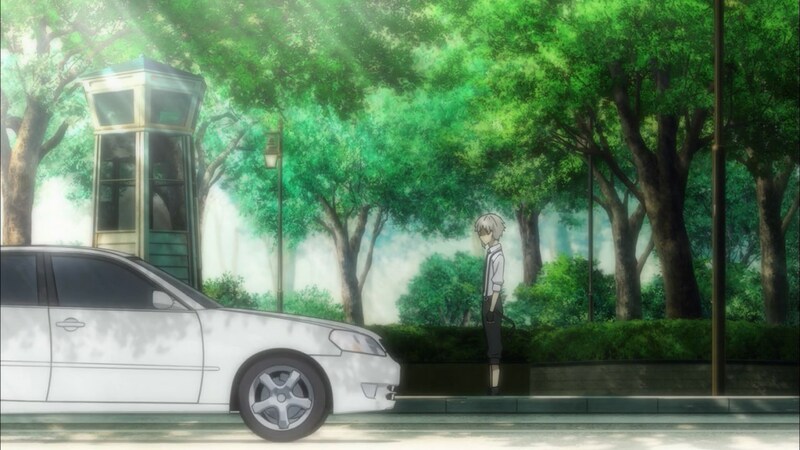 Also, this entire scene pisses me off for some reason. 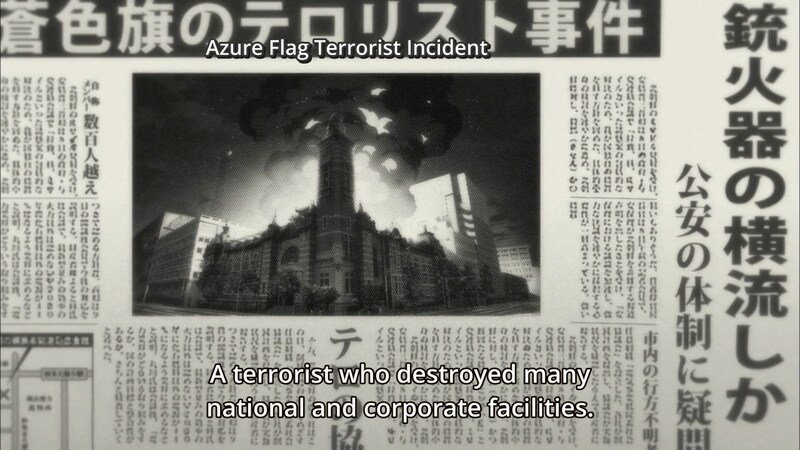 It’s like “let’s make it very clear that this guy is a foreigner”. Solve all problems with money! The fact that this guy keeps walking across the screen means he must be important. Enemy? Wait…I don’t understand. Does she only pull in people? 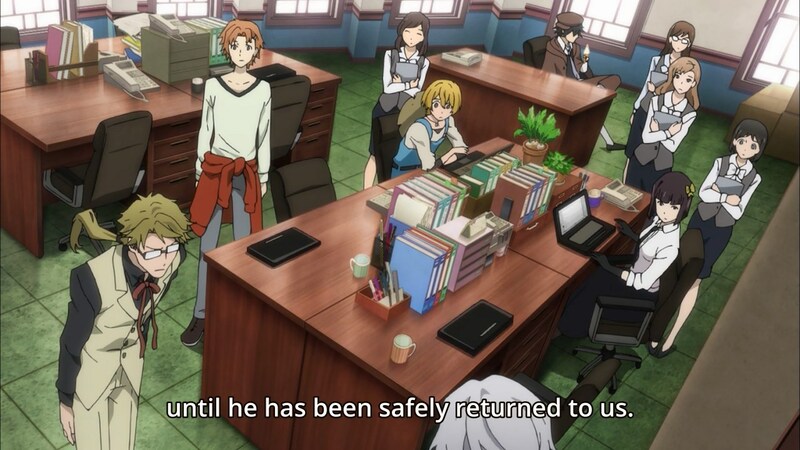 Because the news made it sound like the entire building with Kenji disappeared. 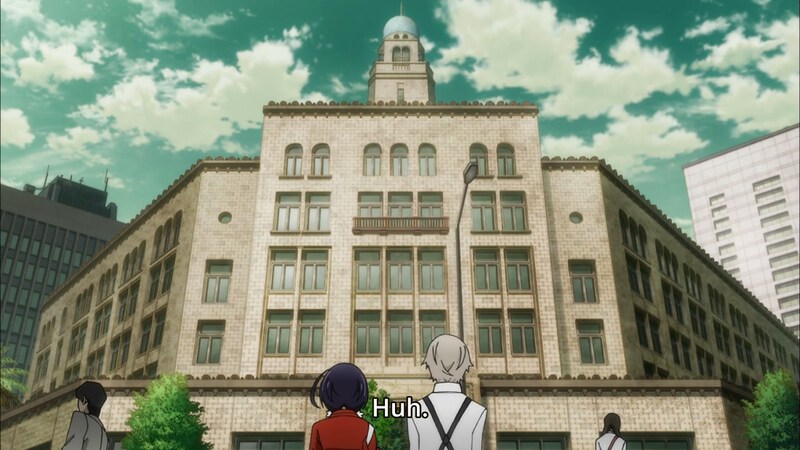 If so, where’s the building? Confidently saying the plan means it won’t work. 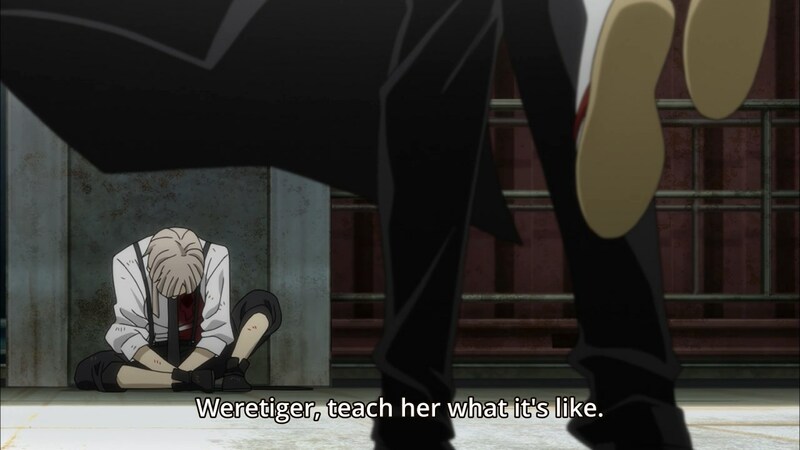 Atsushi, run to the door now while she’s explaining! 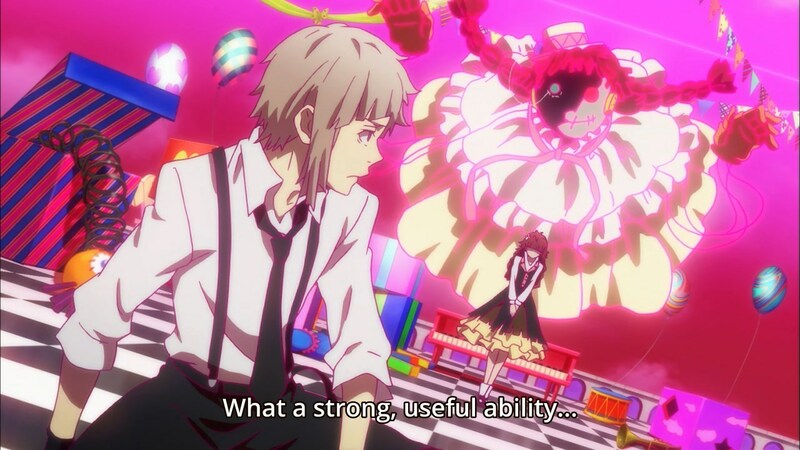 Though, using the key probably takes some time, so his best plan is probably to secretly pass the key to the other guy and distract the doll. 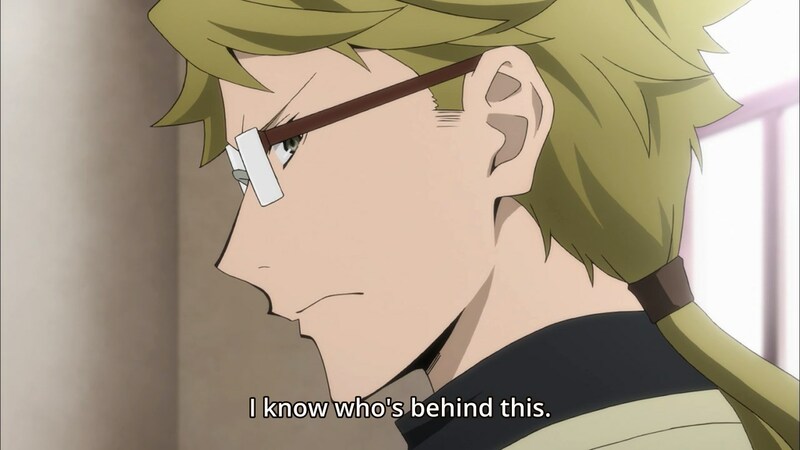 First off, screw you, Atsushi, for holding the key out to the side when you reach the door instead of immediately putting it in the lock. 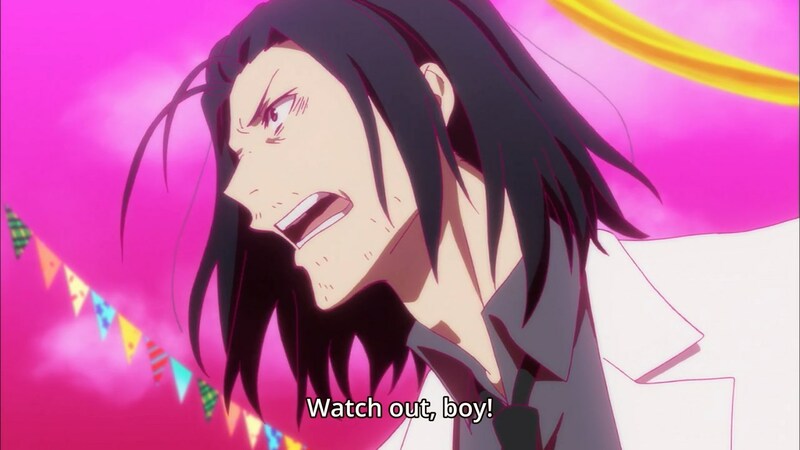 Secondly, this guy warns Atsushi in a ridiculously ambiguous way. 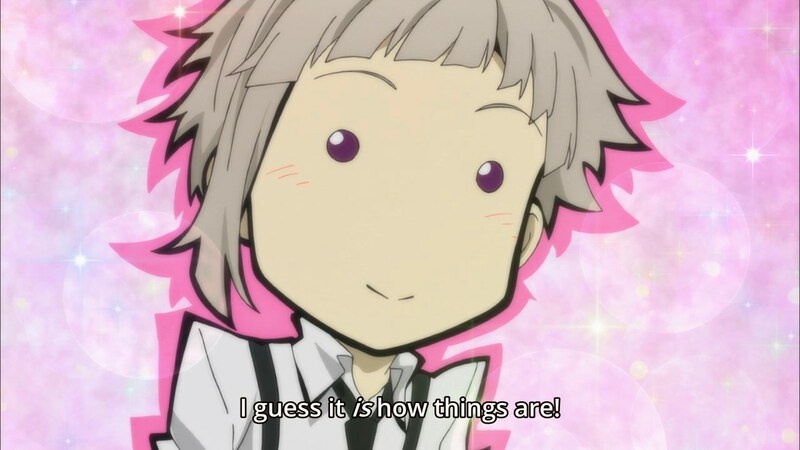 How does Atsushi know he’s talking about the key and not the doll? Don’t you hate it when game masters do this? 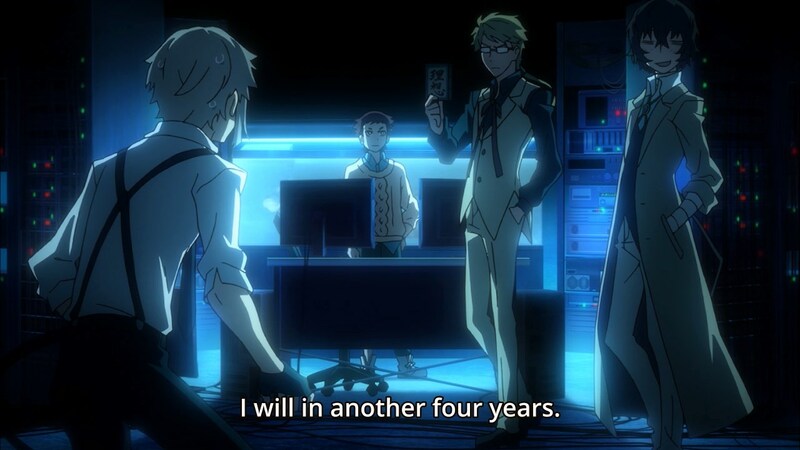 Doesn’t this scene kinda negate all of Atsushi’s recent character growth? 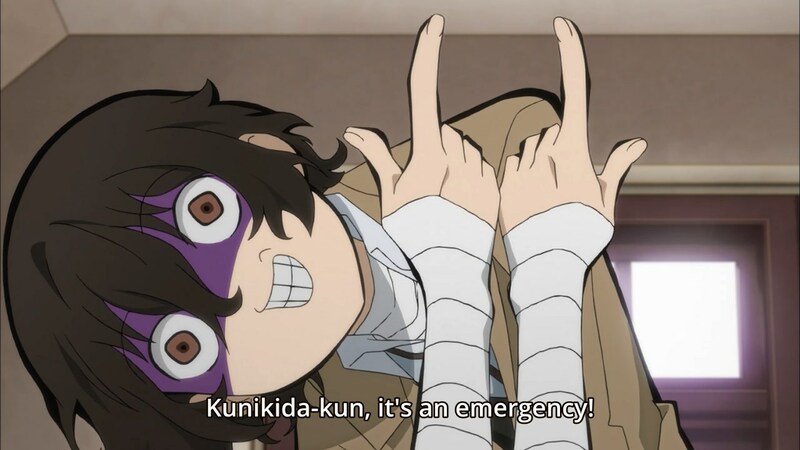 This whole “bumbling idiot is actually the strongest character” reveal would be more interesting if Dazai didn’t already do it in this series. 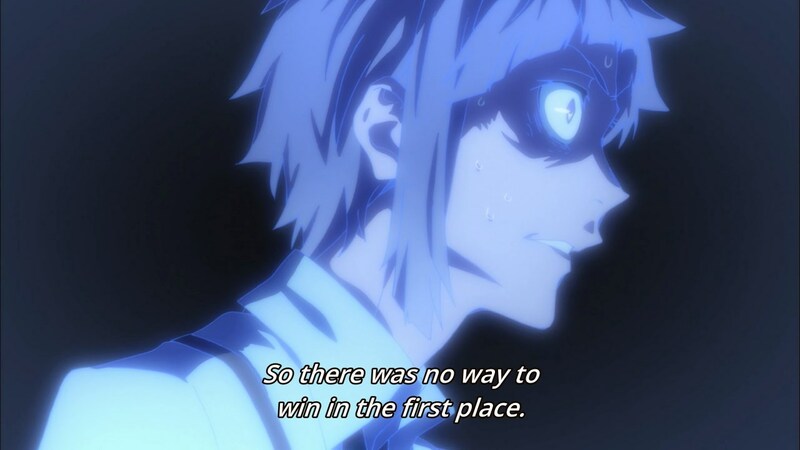 Not bad, Atsushi…but I don’t know if this forgives your attempt to escape earlier. These cars all try to move across the intersection from different directions at the same time. Do you even traffic light? 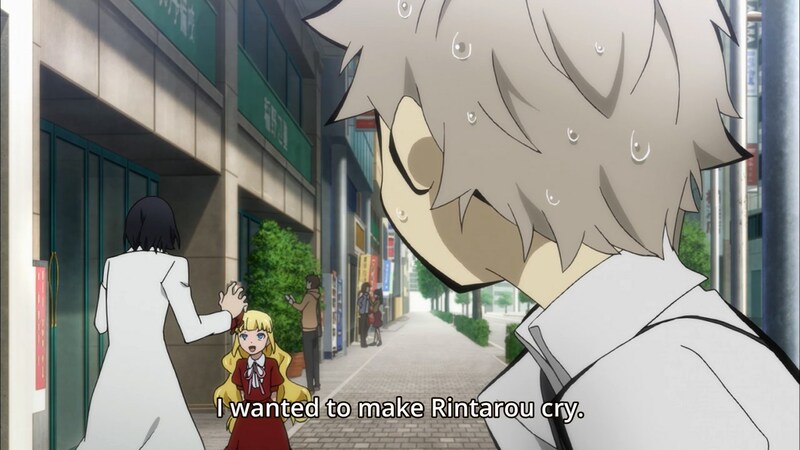 Rintarou? 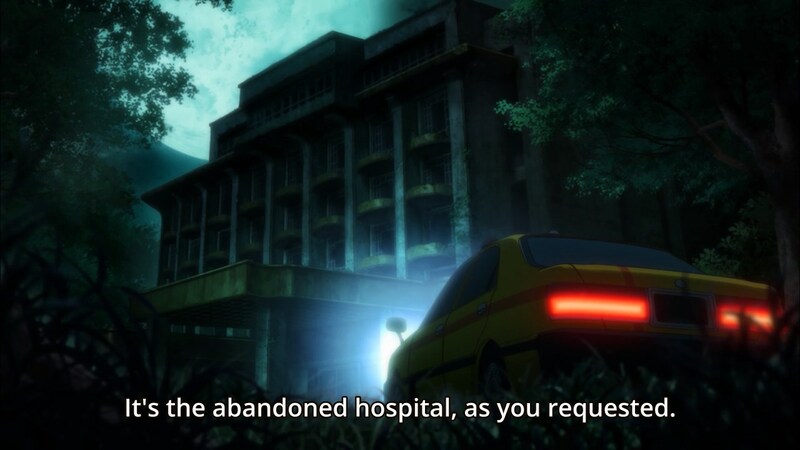 As in Okabe Rintarou? 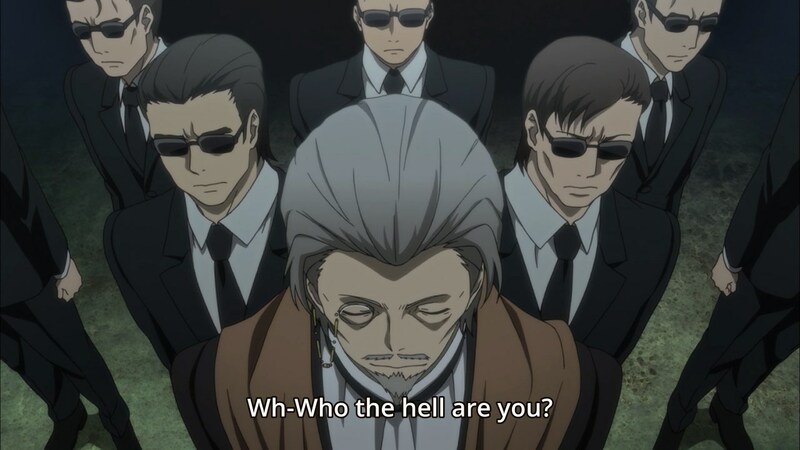 Based on the next scene where it’s revealed that the old guy is the leader of the Port Mafia, I guess this is happening because Kyouka recognized him. I thought it might be some cliffhanger where her powers were rejecting her or something. Well, at least the series didn’t troll us at the end. 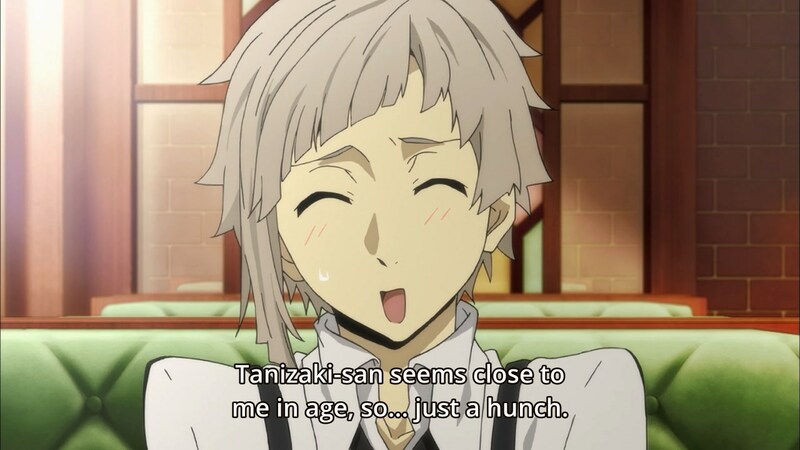 That being said, I question whether Atsushi even grew at all throughout this series. As for the series in general, I’d say nothing special, but definitely not bad. I should just reserve judgment until the next season, right? 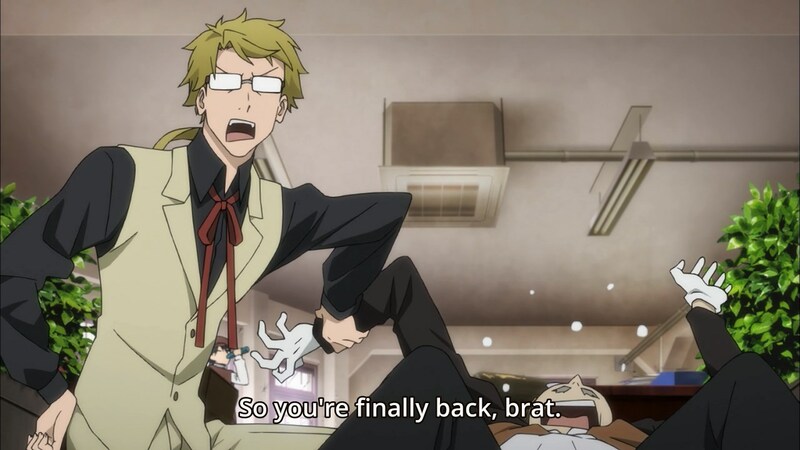 Author marthaurionPosted on June 23, 2016 Categories Bungou Stray DogsTags supernatural powers8 Comments on Bungou Stray Dogs Final Episode (12): The raid bosses appear! Right at the end! Darn…this should have been my post for last week’s episode. It sums up the episode so nicely! 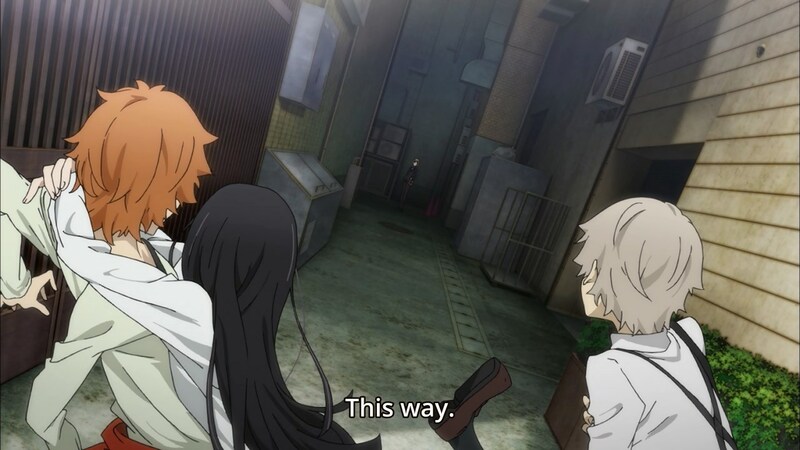 I know it’s pointless to call stuff like this, but he’s going to open the door and everyone will be doing something playful with Kyouka. It would fit the tone of the series. 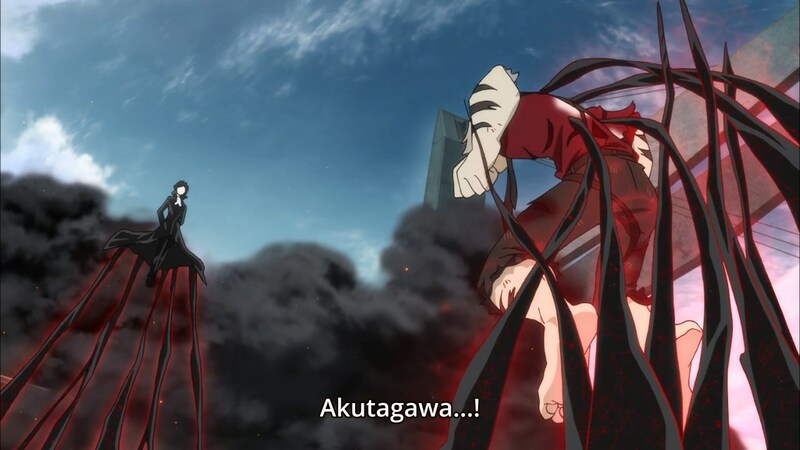 The fact that Kyouka wants to disprove Akutagawa’s claim that she can only kill with her power is somewhat typical of anime, but perfectly respectable. I have no problems with this. 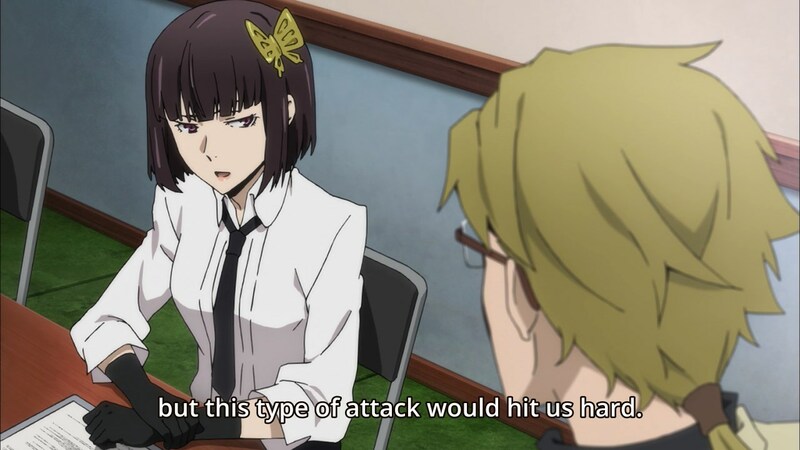 At least she has a good reason (looking at you, Atsushi). 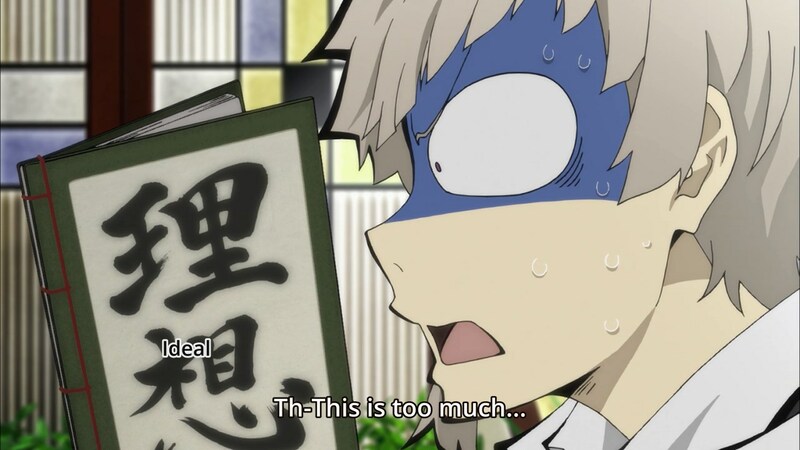 Oh no…I’m so worried about Akutagawa right now…I can’t even control the monotone level of my written voice. 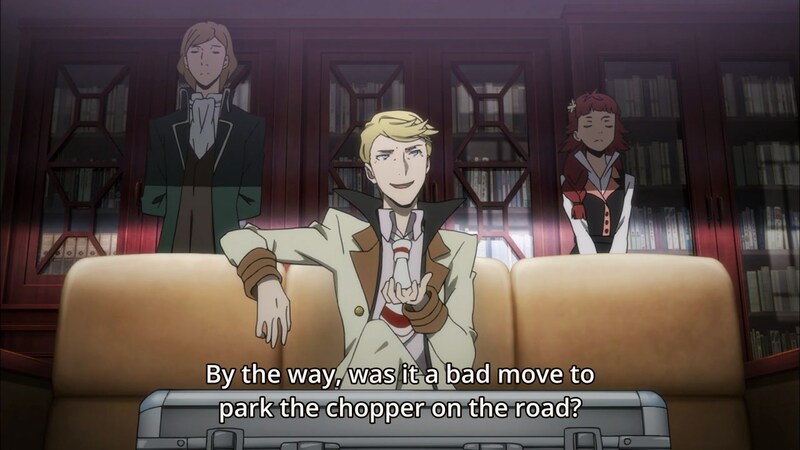 Why even bring this guy back? He did absolutely nothing the last time he showed up. 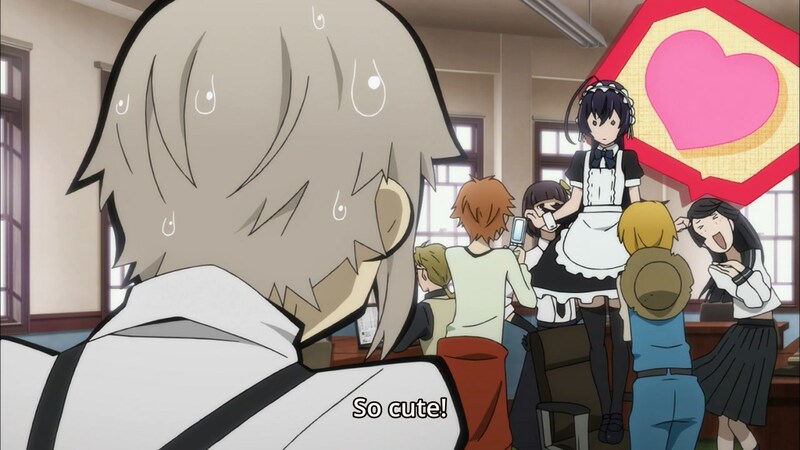 She wants to senpai to notice her so much, but her senpai is too busy trying to get his senpai to notice him. 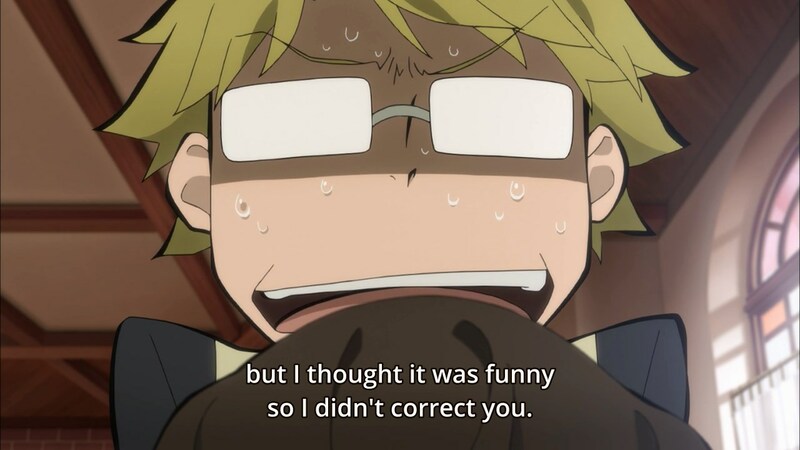 Standard anime. Guys…you have automatic rifles. 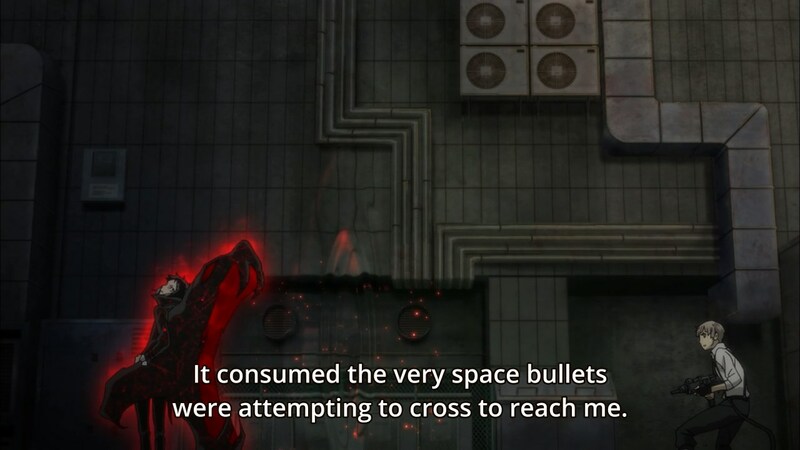 You can’t honestly be this bad at aiming, can you? She’s literally right in front of you. I don’t even think Stormtroopers are this bad. 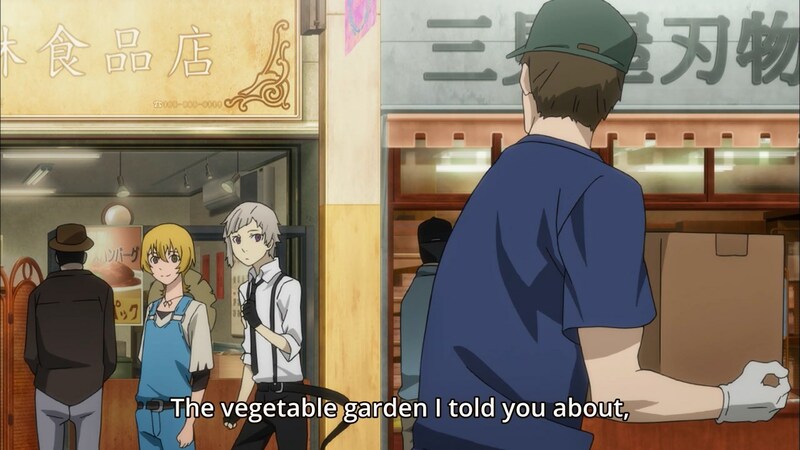 All I’ve gotten so far from this is that this half of the episode is focusing on the overalls kid. 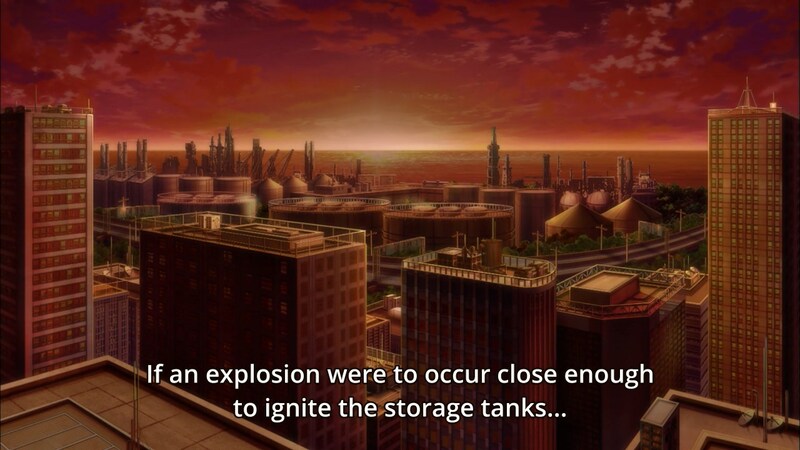 Oh, and something exploded! This looks like the face of brainwash! 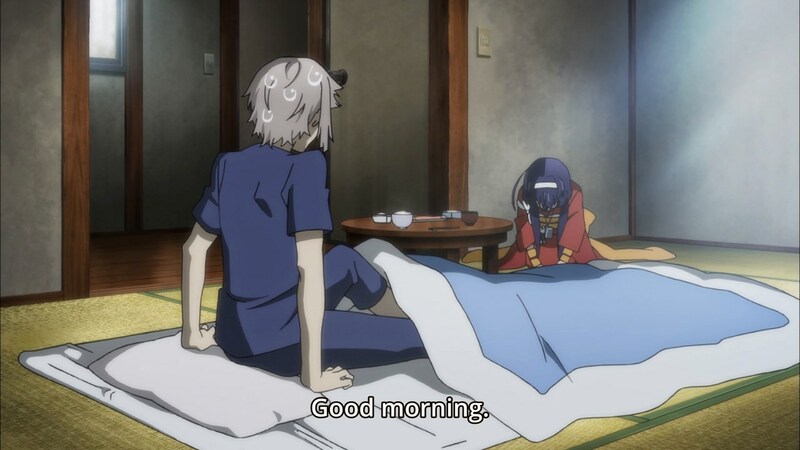 Pretty boring episode this week…I honestly wasn’t a fan of either half. 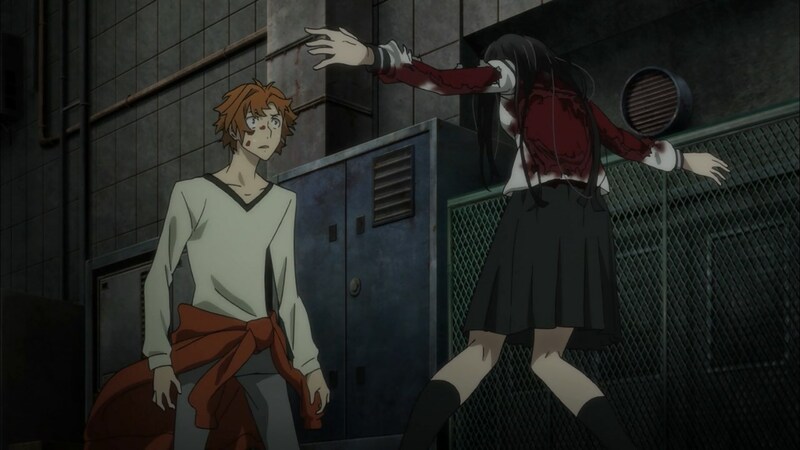 The second half of the episode felt like it could have honestly happened at any point during the series (minus the Kyouka fluff). The first half…well, let’s ignore the first half. 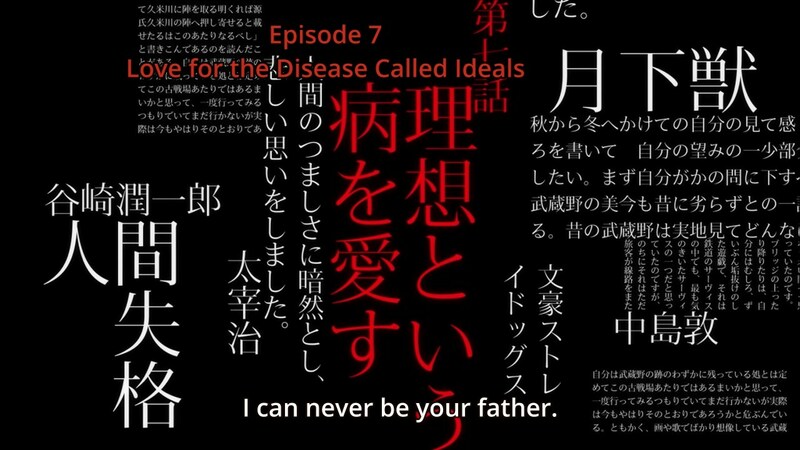 Anyway, next week’s episode finishes things off for this series. 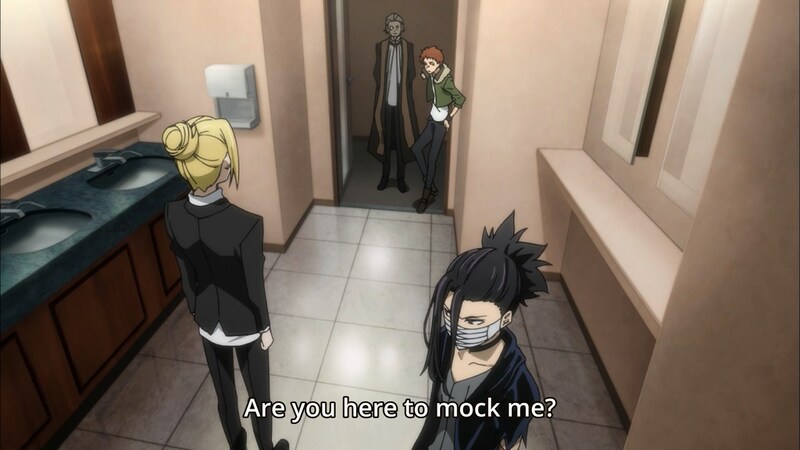 One more showdown with the Port Mafia or will we finish things off with more filler to cool down? 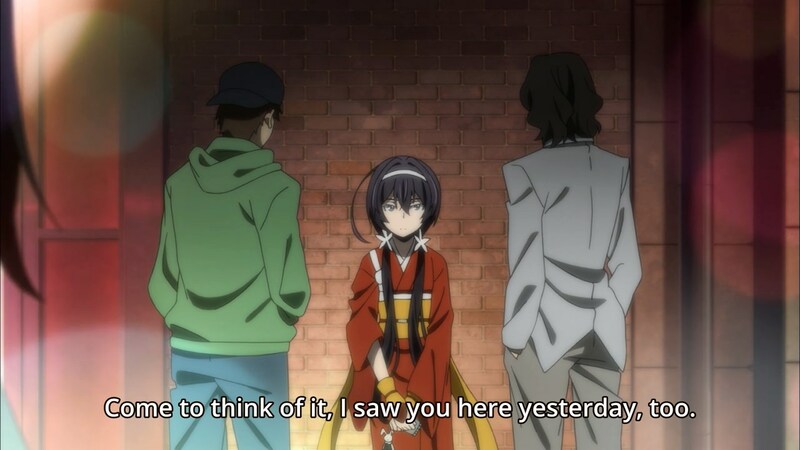 Maybe something focused on Kyouka? I’m having the hardest time getting invested in this fight. 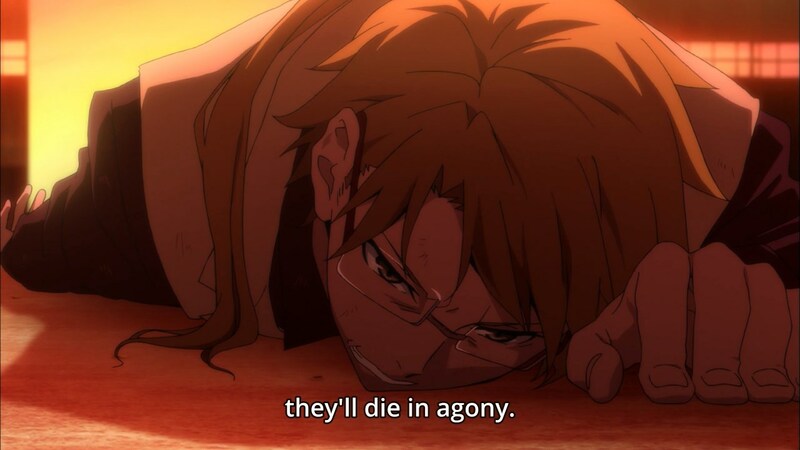 This will all end up going according to his plan, so I guess we just sit back and watch Dazai get pounded for a bit. 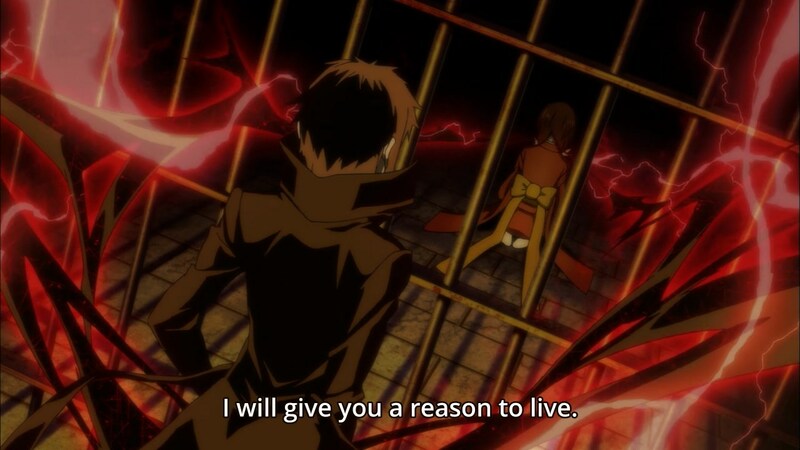 I mean…I’m okay with this being the reason that they don’t kill Dazai right now. 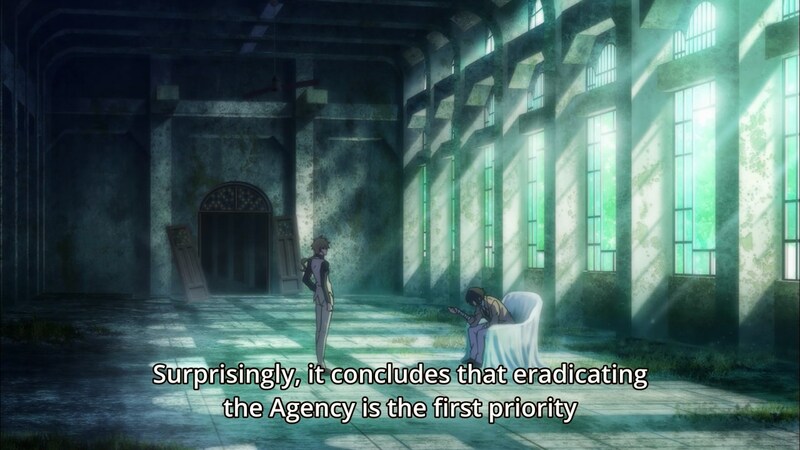 But if he knew such sensitive secrets about the organization, why didn’t they kill him earlier? This blackmail works for some reason. 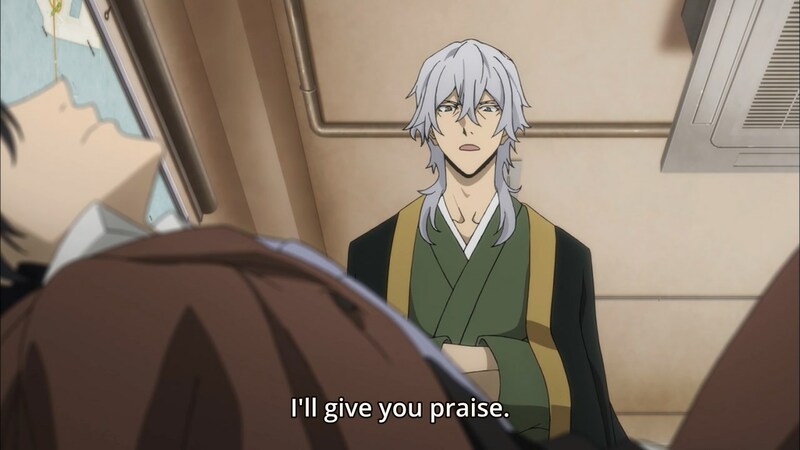 Are we sure this guy is really Dazai’s former partner? 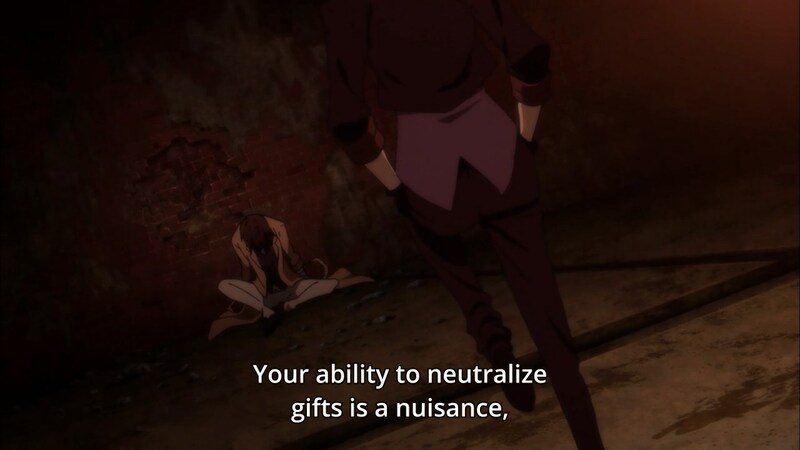 Something about Dazai just doesn’t sit well with me and I feel like this entire first half of the episode illustrates it. 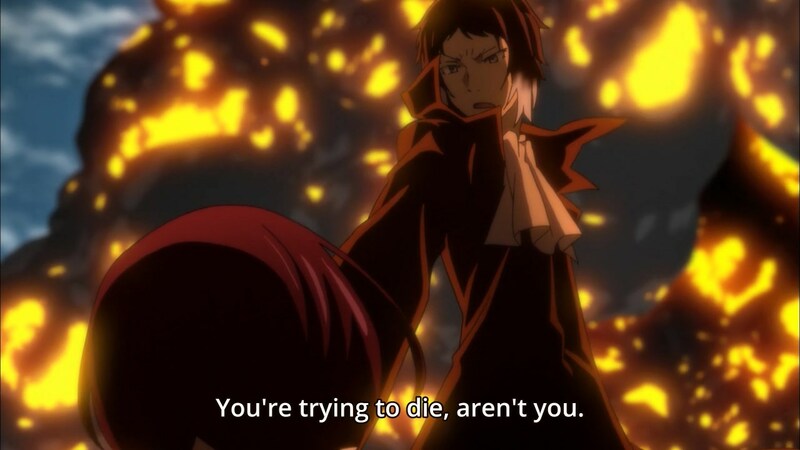 Wait…you were trying to kill Atsushi? Weren’t you trying to collect a bounty? 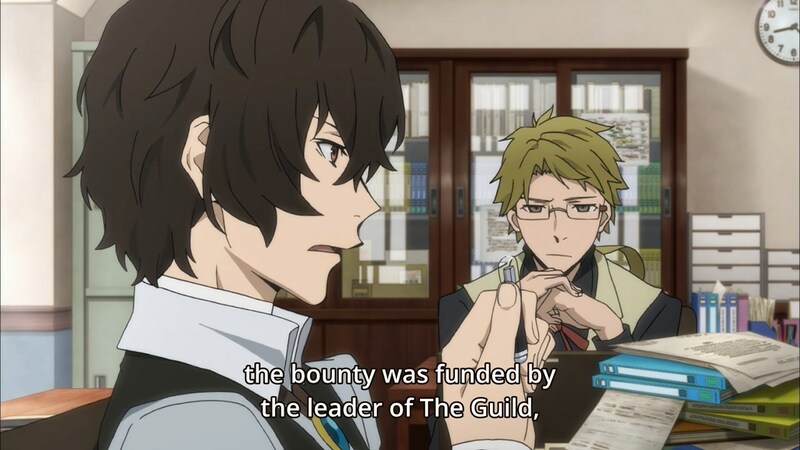 And don’t say “but the bounty could be for the weretiger dead or alive” because there’s no reason to keep him alive right now. Just kill him right now. 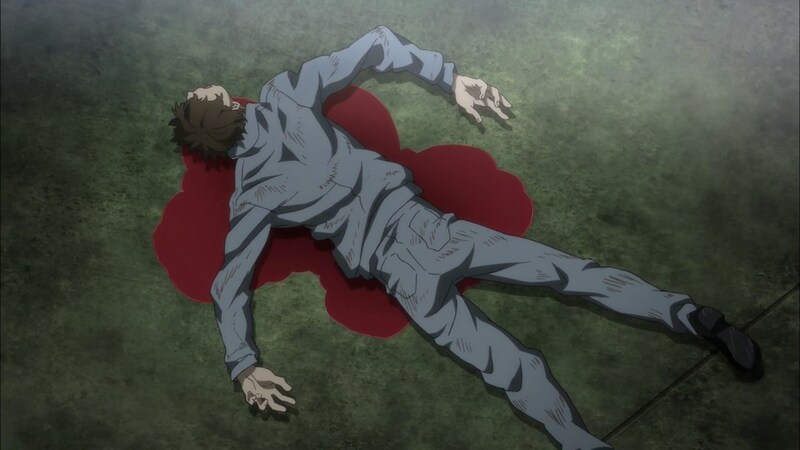 Leaving him alive just gives him plot convenience. The weak die for the strong? Where have I heard this before? 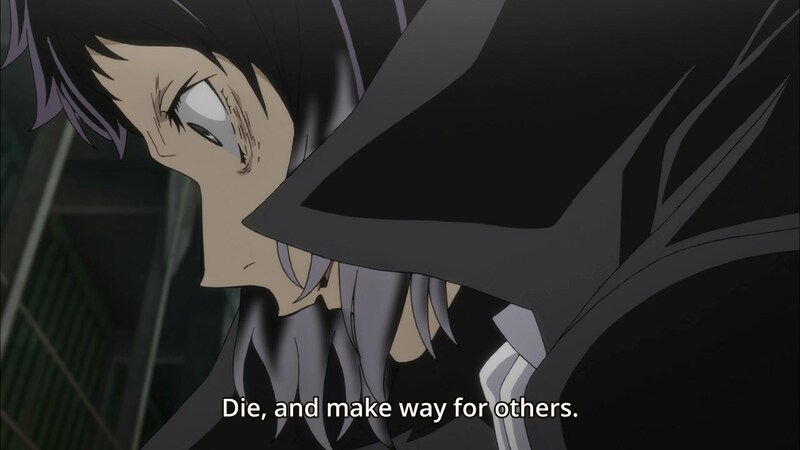 Uhh…you don’t want to do that, Akutagawa. 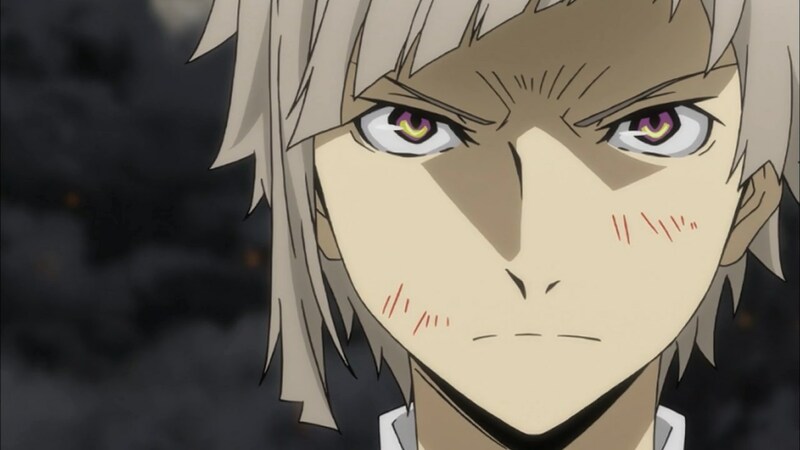 Atsushi’s power is a destructive, killing power that he can’t control just like Kyouka’s power. He’s going to use his protagonist ways to tell her that she can live a happy life. WHAT? 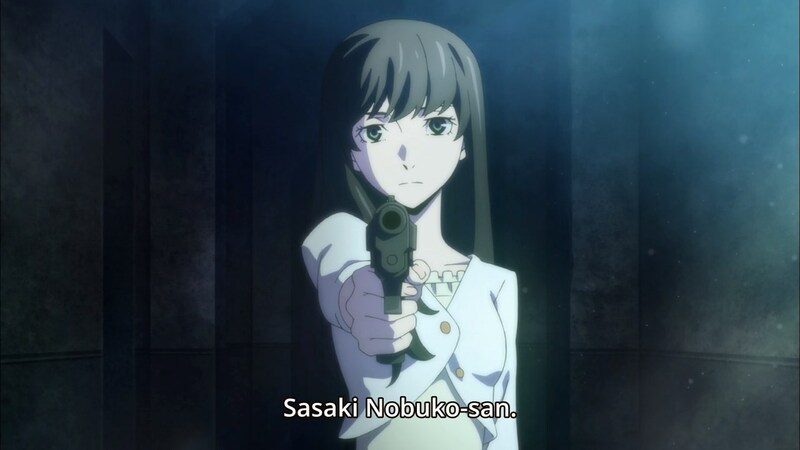 Where was she hiding the trigger? 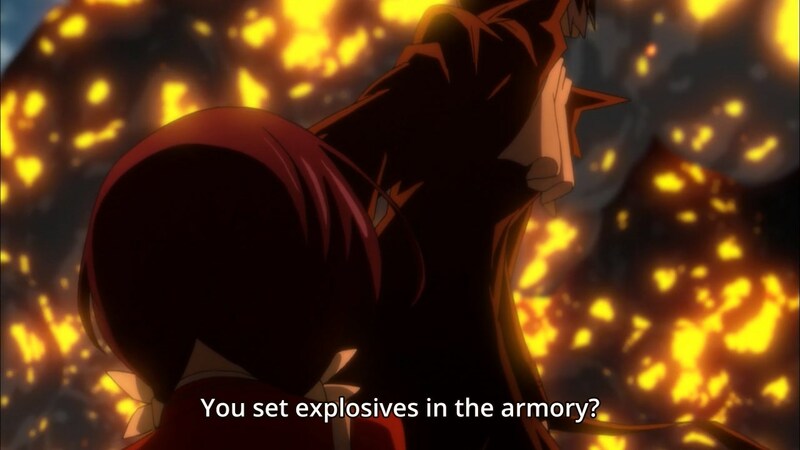 How did she find explosives? 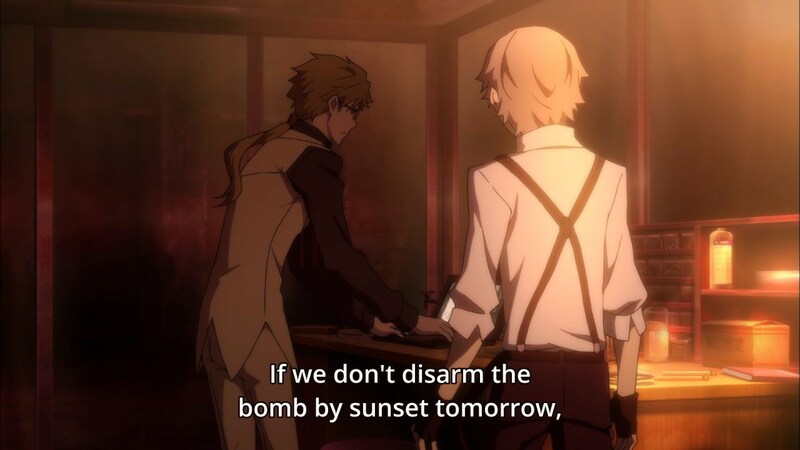 And if the explosives were in the armory (which makes sense), how did she get access to it and why didn’t Akutagawa say something like “you triggered the explosives in the armory?” Heck, I would have been fine with “set off explosives”. 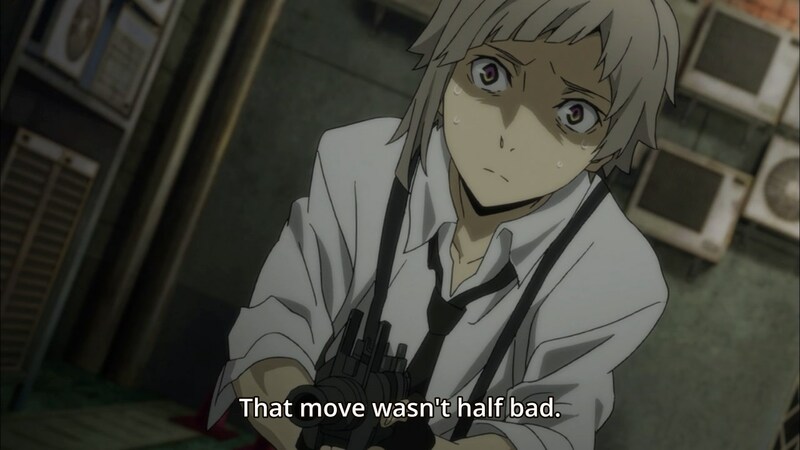 Uhh…if Atsushi only has weretiger mode enabled for his hands, does that mean he was able to pull Kyouka away from Akutagawa’s attack just using his human running speed? HAHAHAHA! 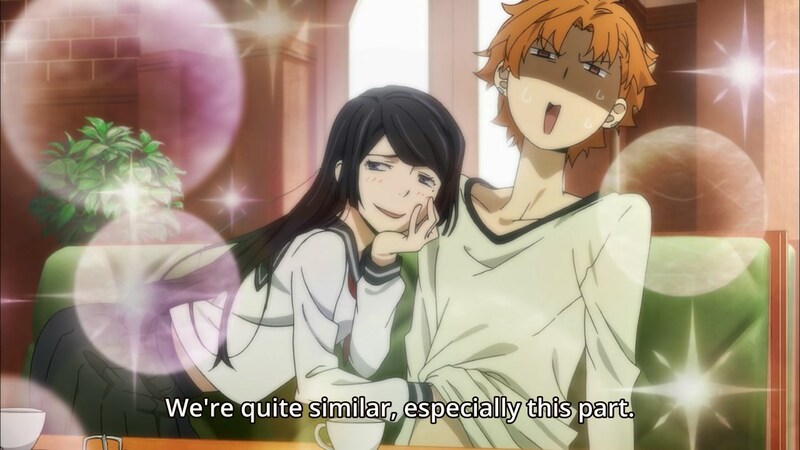 They actually did the quick swap between their two faces while zooming scene for these two? That is so cheesy! Holy crap, this guy is indestructible. Wait…what? 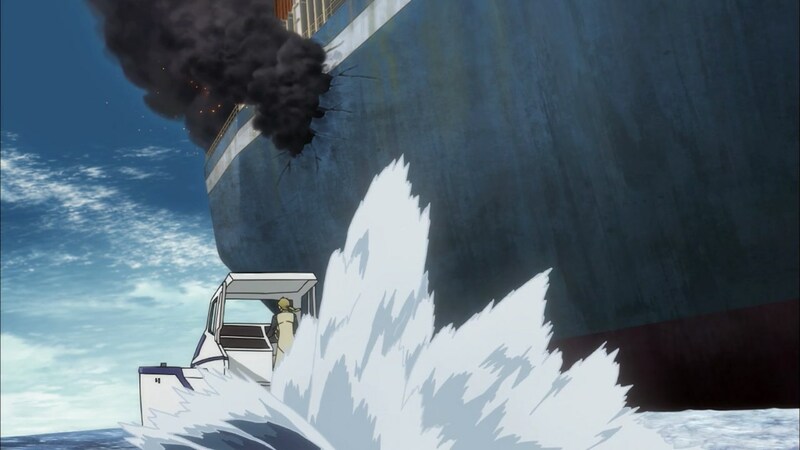 I know water can have a lot of resistance if you hit it with too much velocity, but you honestly expect me to believe that letting these two land face-first into this boat is a better landing than letting them hit the water? 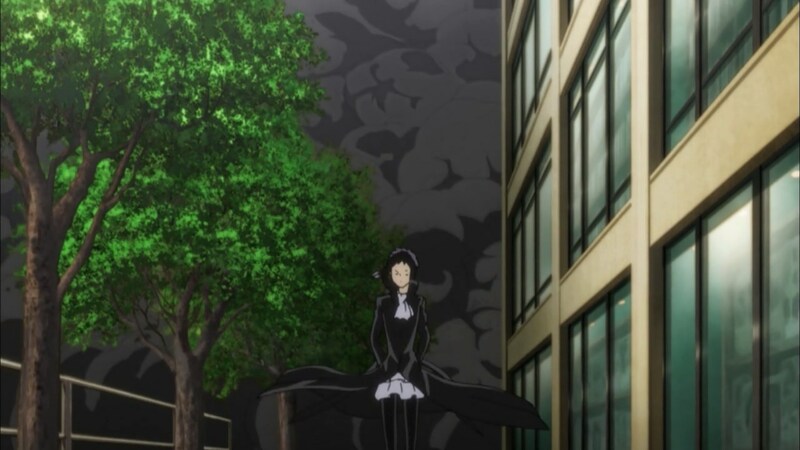 Although, it looks like next week’s episode is randomly about that female Port Mafia character from so many episodes ago. What’s the point? 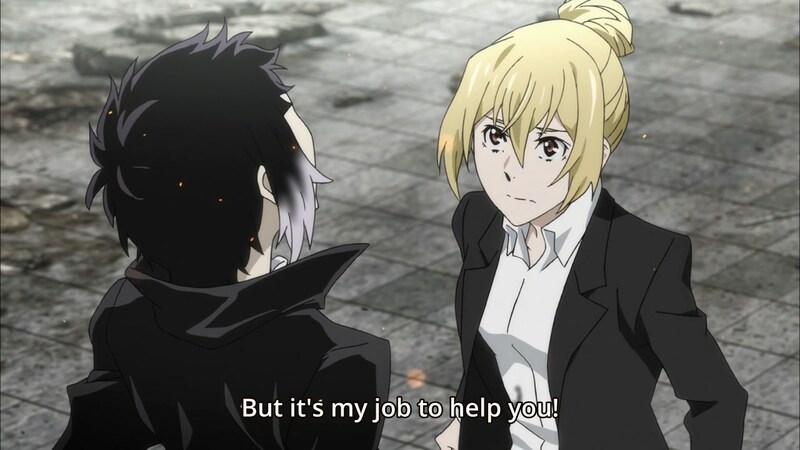 To get her or Akutagawa to join the Agency’s side? 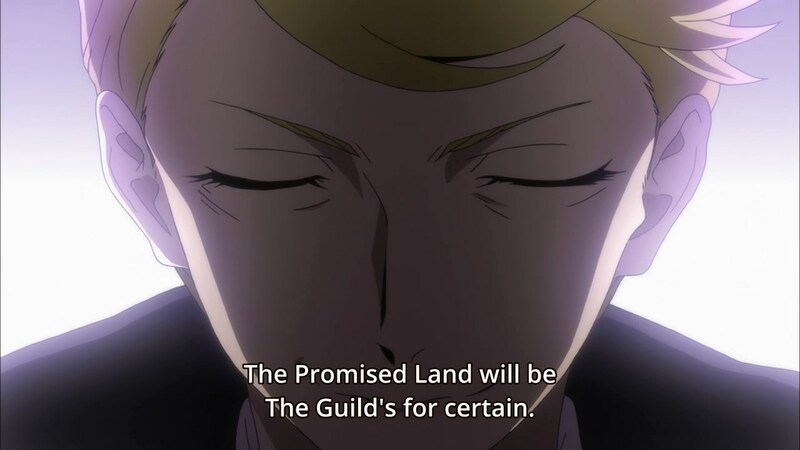 I guess we won’t have enough time for this Guild guy. 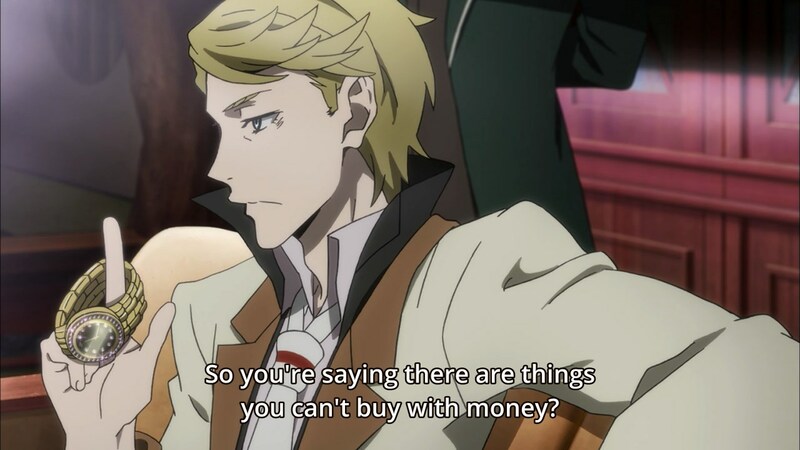 Bungou Stray Dogs Episode 9: RIP Atsushi…’s wallet? 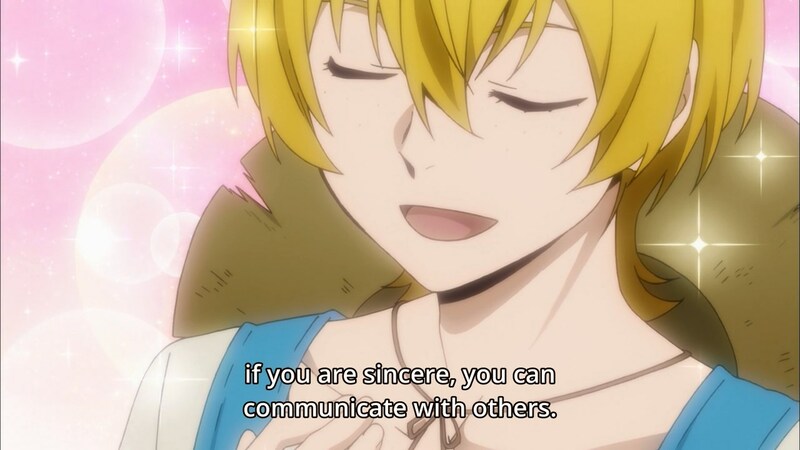 I get that this is supposed to be part of her personality and whatnot, but I’m going to get really upset if this line is repeated too many time in this episode. It’s like the orphanage scene that we keep having to see. It’s such a pain to animate mouth movements in this scene, am I right? This entire conversation is just a still frame. Haha she actually makes them bribe her with tofu? I respect that. 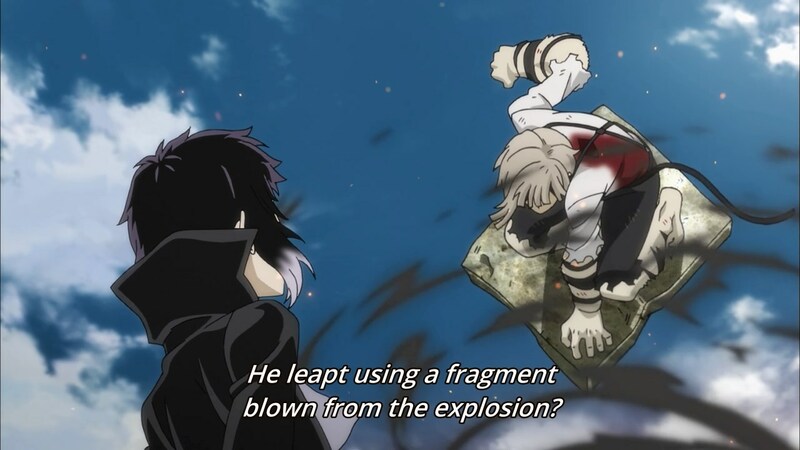 I don’t fully understand how Dazai’s power works in this scene. 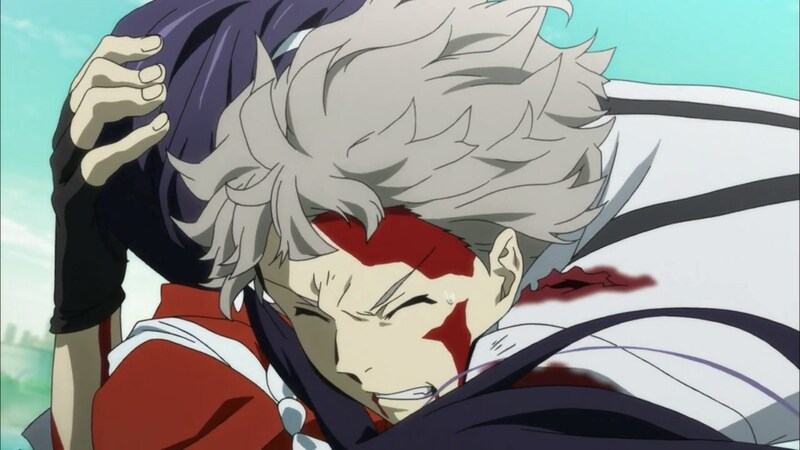 This choke hold looks really uncomfortable, but the power still takes a couple of seconds before nullifying Akutagawa. 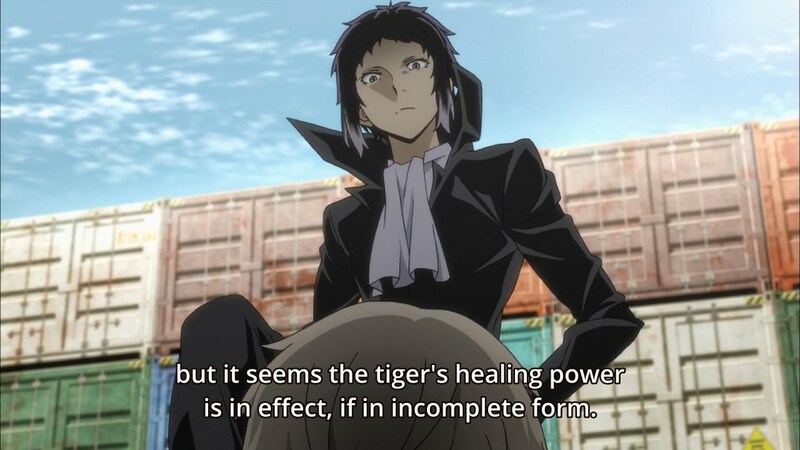 If that’s the case, could Akutagawa change his power into a spike and stab Dazai before Dazai’s power can activate and nullify it? 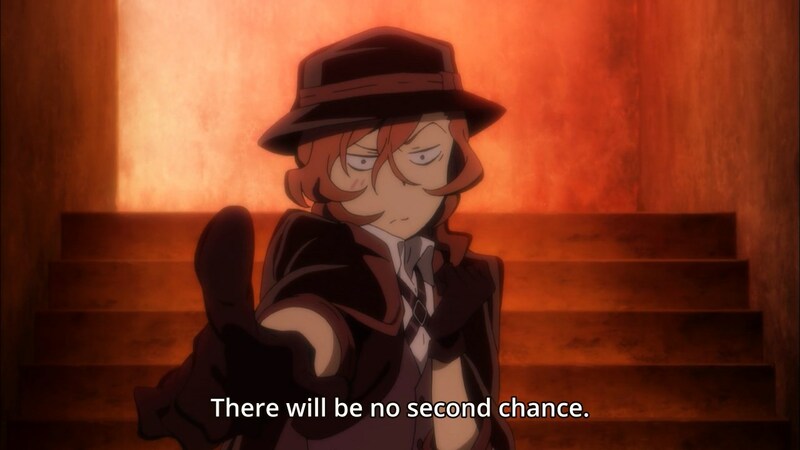 I suppose he could always just use a gun to kill Dazai, so he probably just wants Dazai alive. Still…I’m mostly questioning if it’s theoretically possible. 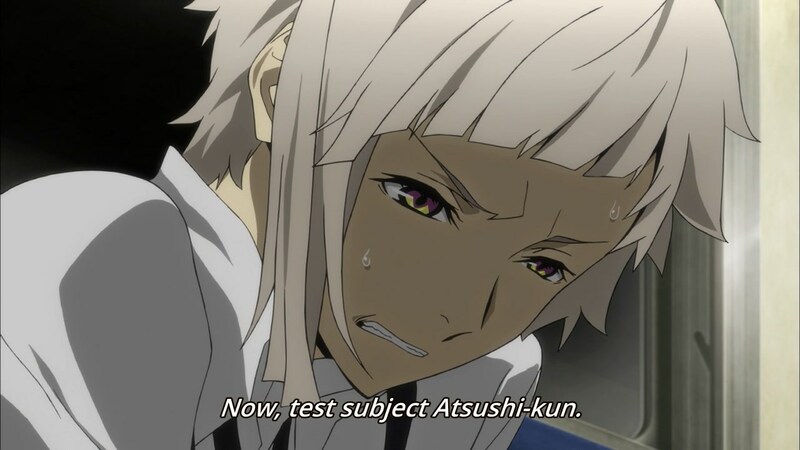 I almost got too distracted by Atsushi’s face here to notice the mistake. 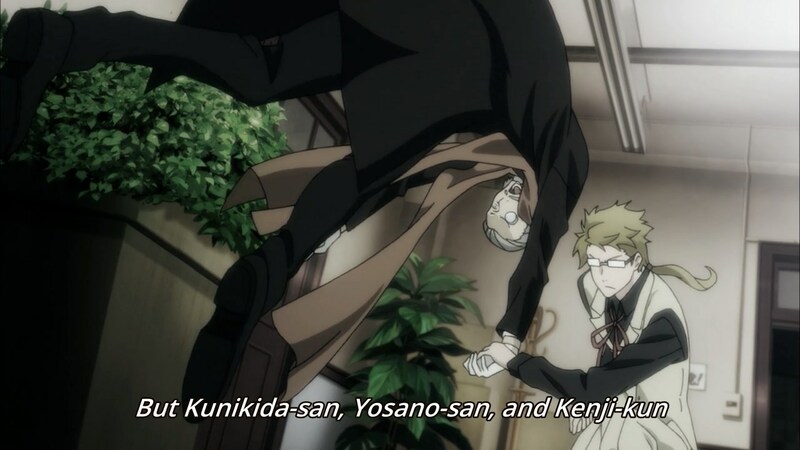 Wait…he just lets Dazai go? 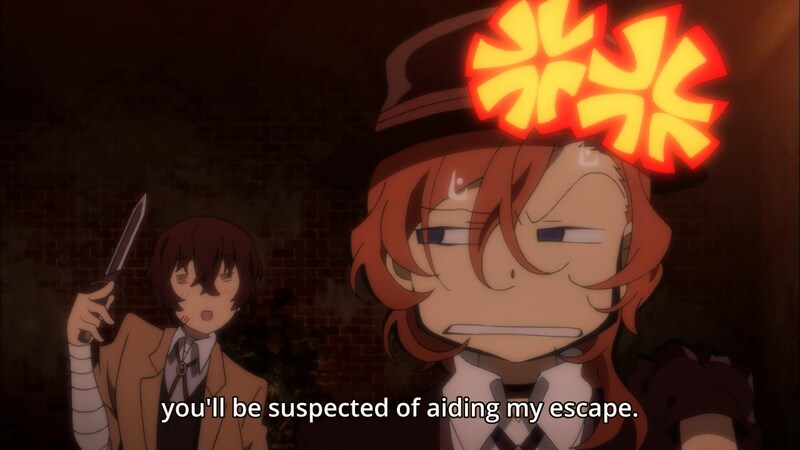 I wouldn’t be surprised if Dazai says “you fell for it” and just gets away. 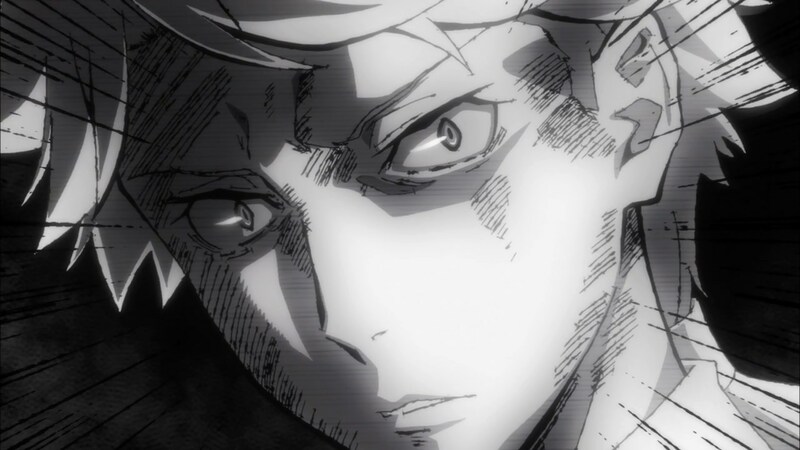 Not much from Atsushi this week, but next week’s episode looks promising. 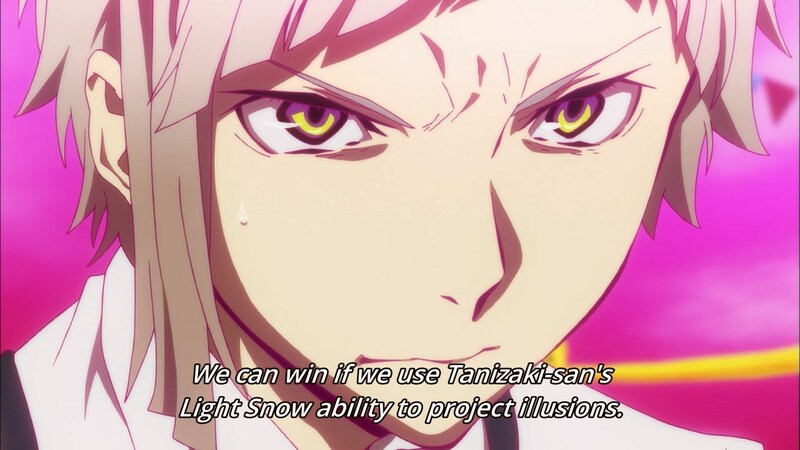 From the preview, it looks as though Atsushi will be doing all of the work. He’s becoming so useful! 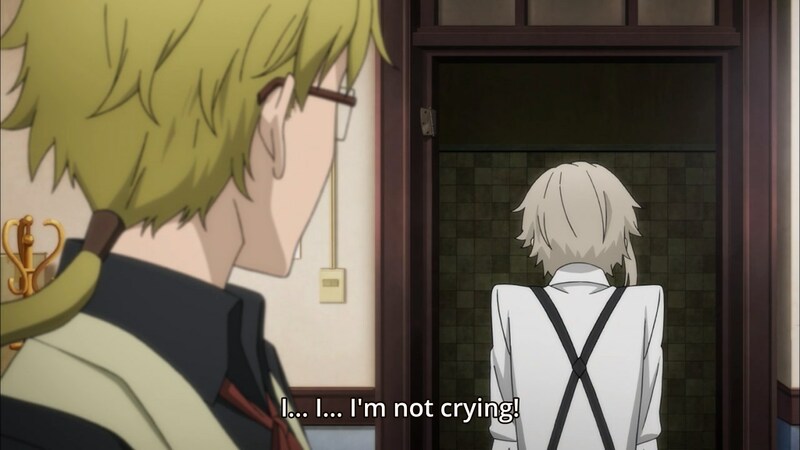 As for this week’s episode…okay, guys. 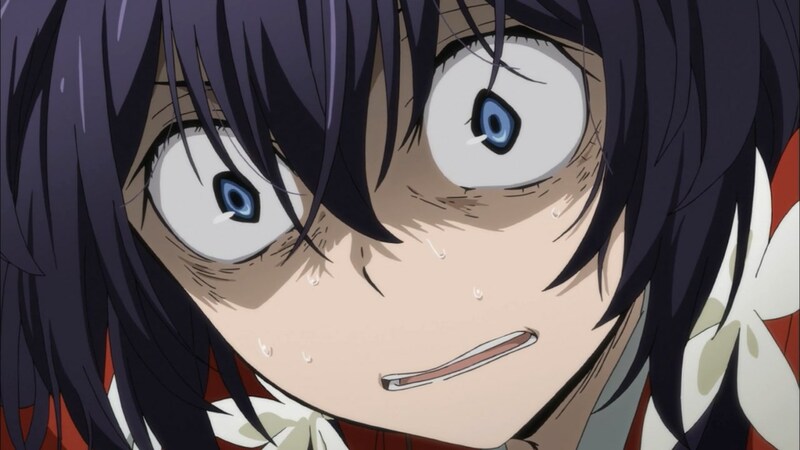 Go ahead and give me the Kyouka fangasm. I’m ready for it! 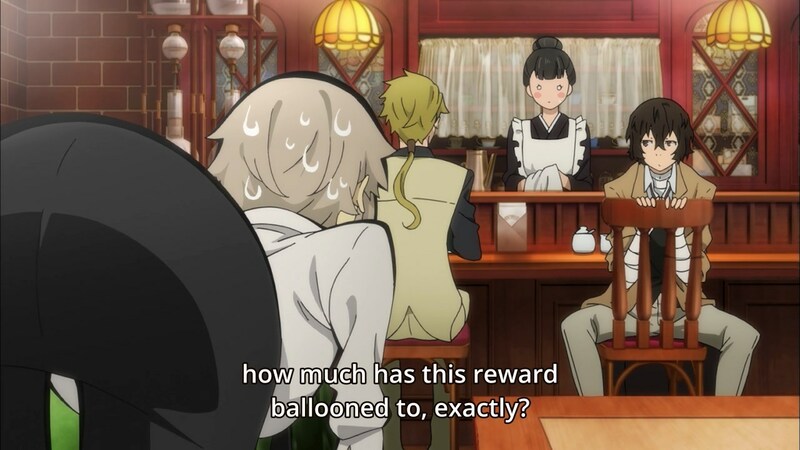 Author marthaurionPosted on June 2, 2016 Categories Bungou Stray DogsTags supernatural abilities2 Comments on Bungou Stray Dogs Episode 9: RIP Atsushi…’s wallet? I’d personally be more interested in the annoying phone ringing, but that’s just me. 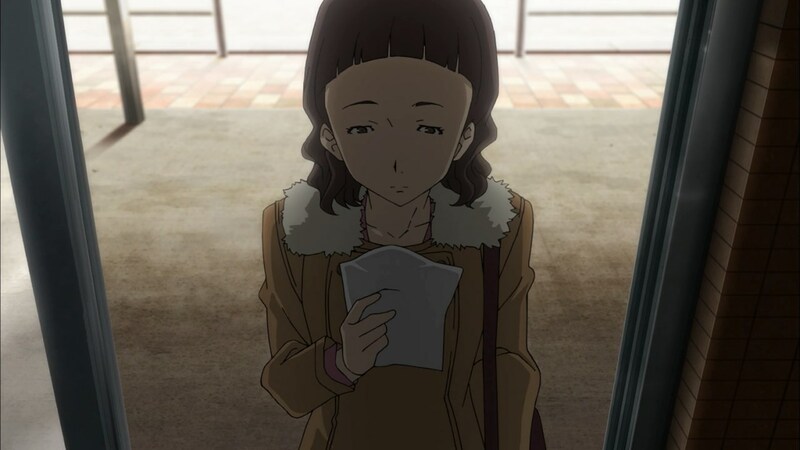 I’ve seen this girl somewhere in Bungou Stray Dogs fanart online…is she supposed to be a major character? 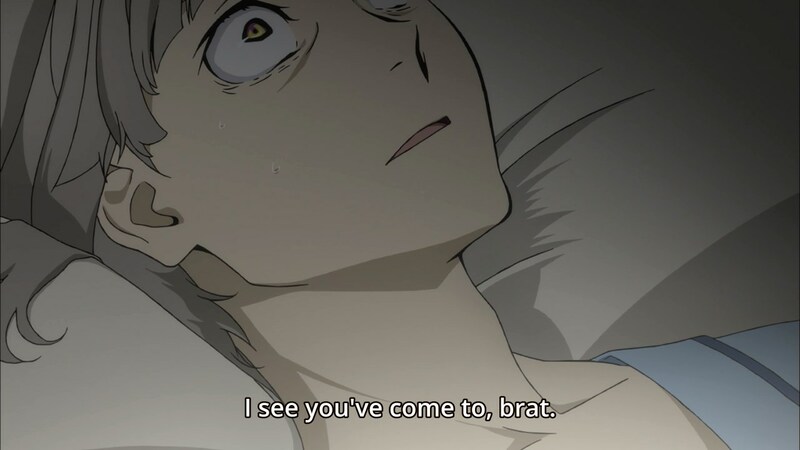 But then again, I really shouldn’t draw conclusions based on fanart. But…why? 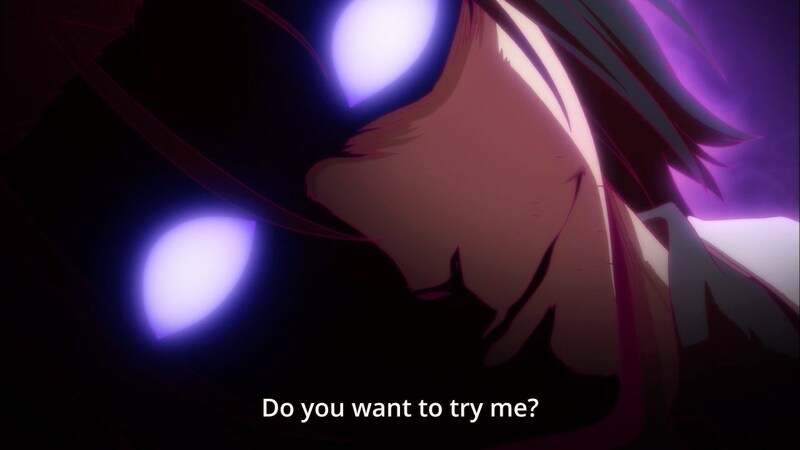 She’s clearly using a power and she willingly touched you to do it? 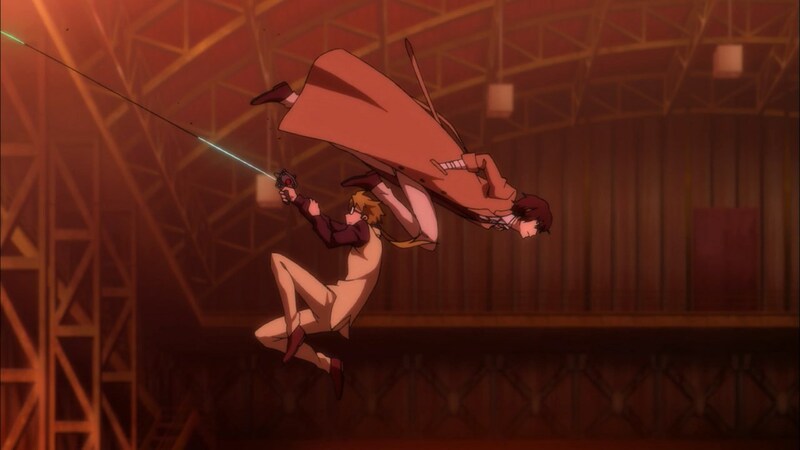 You’re safe, Dazai! Four times with her? High five, man! 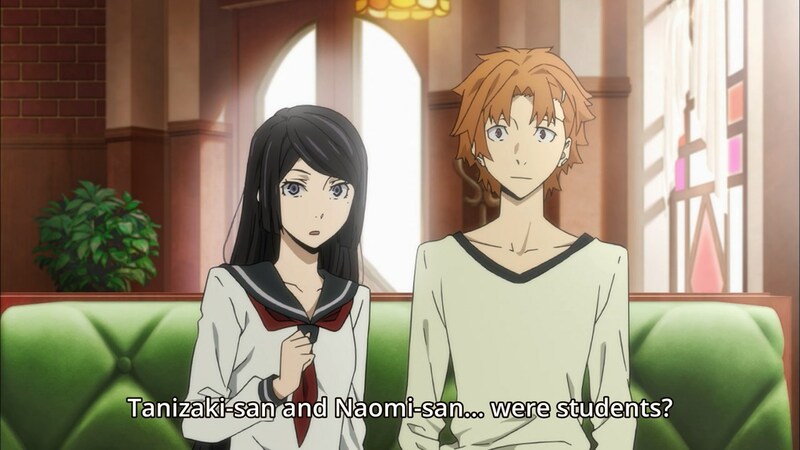 If she says this right before these two are caught in a surprise attack, I’m going to be upset. 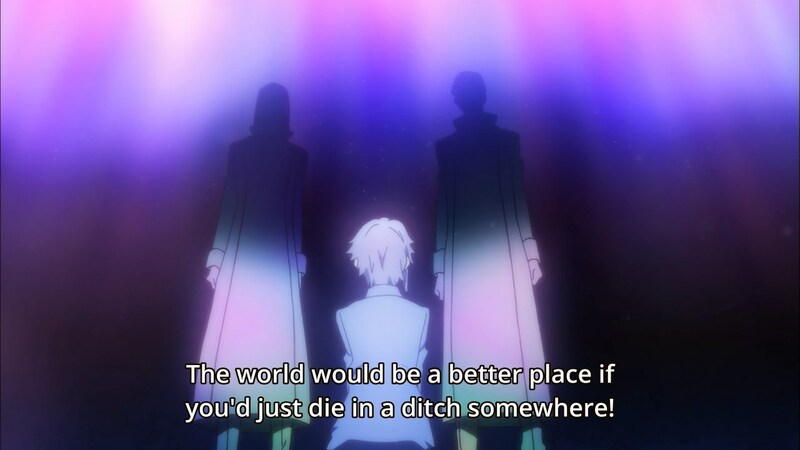 Ugh…he calls Atsushi out specifically. 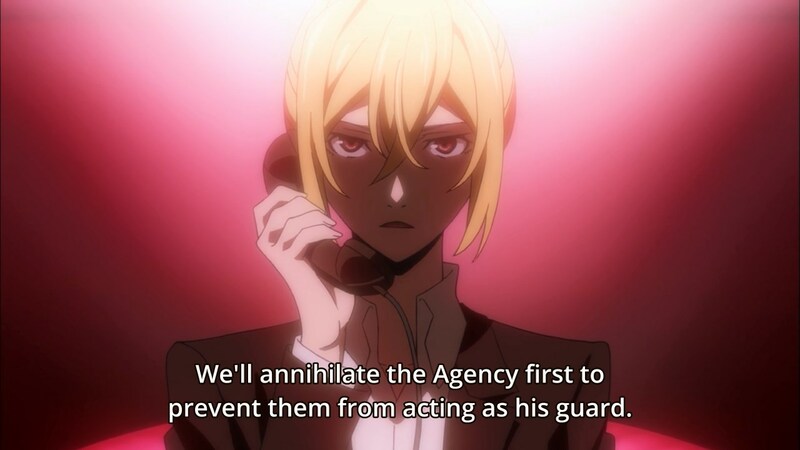 That means Atsushi is the target…it is the Mafia after all. I hate it when people do this…declaring that something is going to happen in some “unknown future time” only to have it happen immediately. 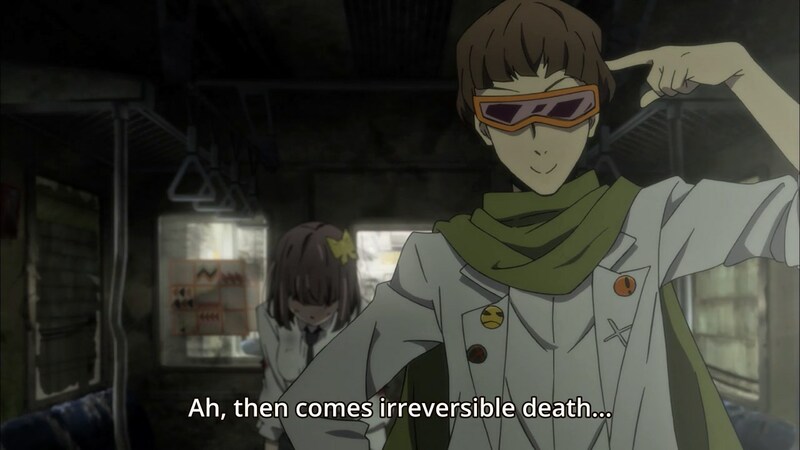 As opposed to reversible death…I guess it’s a show about supernatural abilities, so I can’t get too upset. 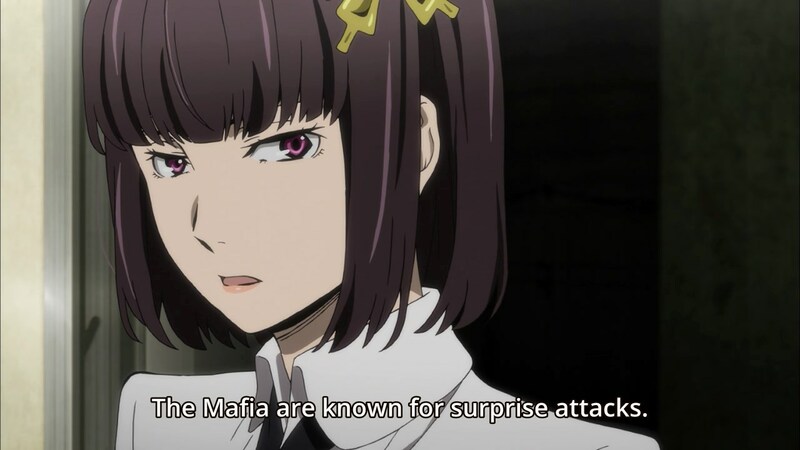 The Port Mafia Assassin label means she’s going to be an ally soon, right? STOP SHOWING ME THIS SCENE! 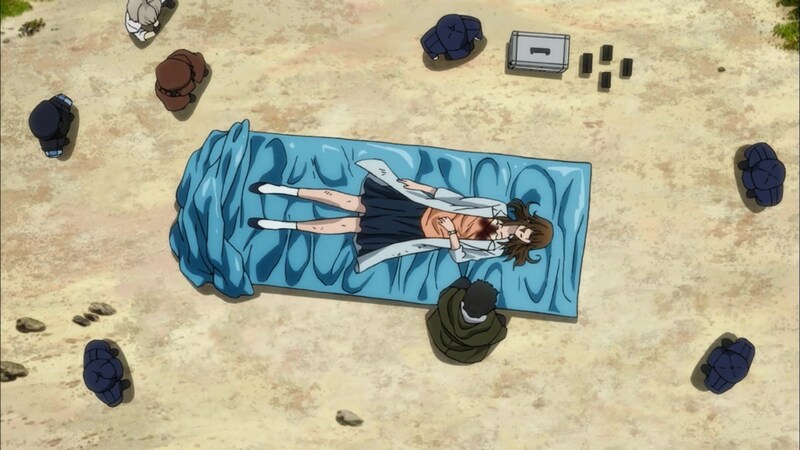 This guy should really be suspicious about the fact that her body is covered in burn marks from his bombs. Haha…ridiculous speeches aside, this is an awesome power. 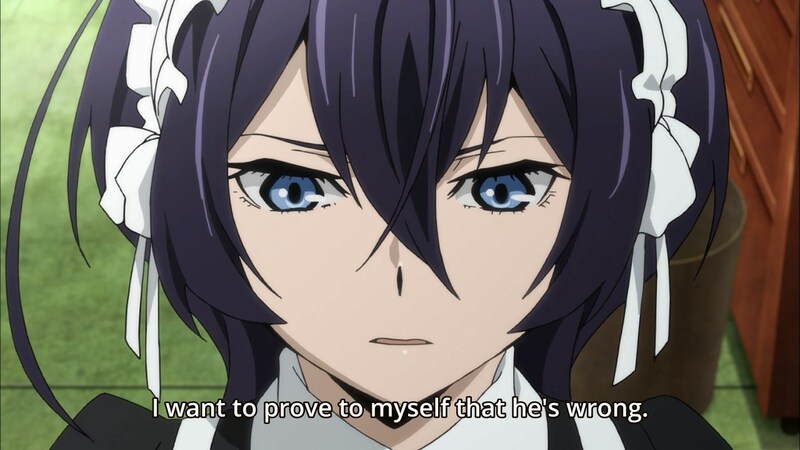 It has a reasonable limitation and she adjusts for it by basically torturing her allies. These kinds of balanced powers tend to be my favorite. 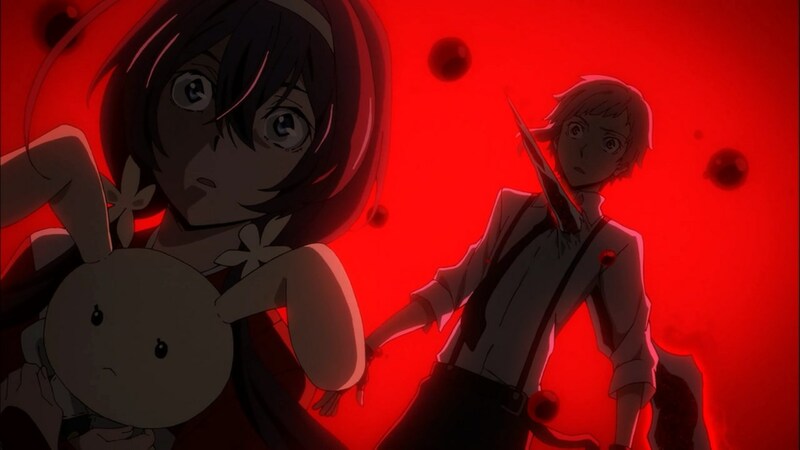 Time for Atsushi to save her, right? 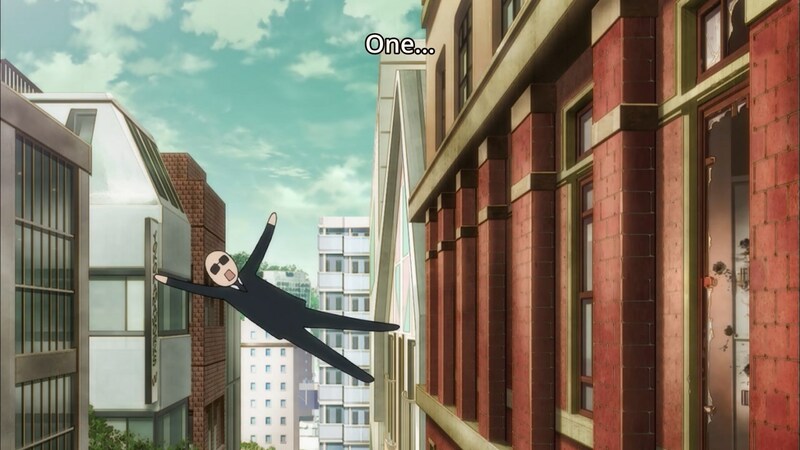 And this is the moment when the fanart starts. Still, doesn’t this feel a bit rushed? 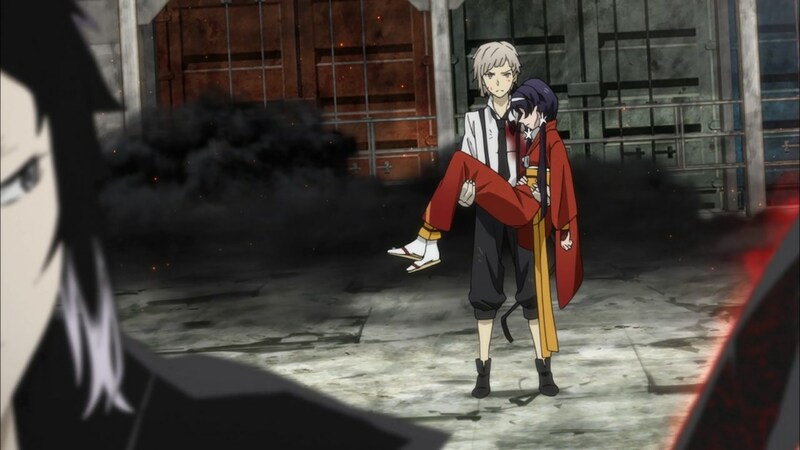 Wow…I was honestly expecting Atsushi to save Kyouka in a later episode. This developed pretty quickly. But that aside, woohoo! 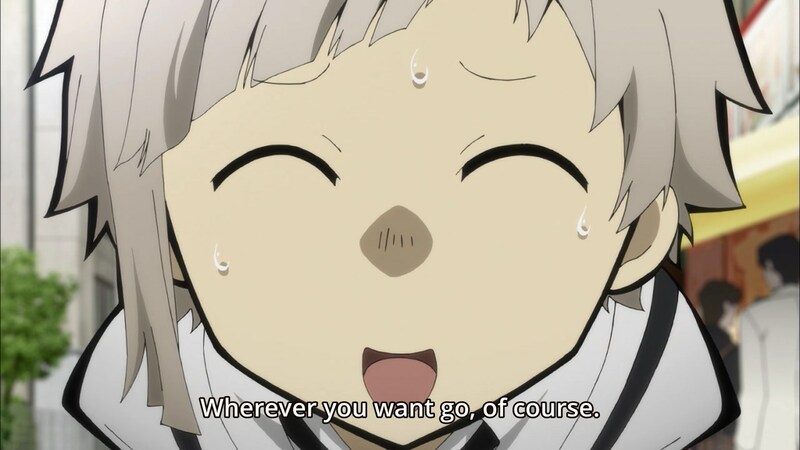 Atsushi is helping! 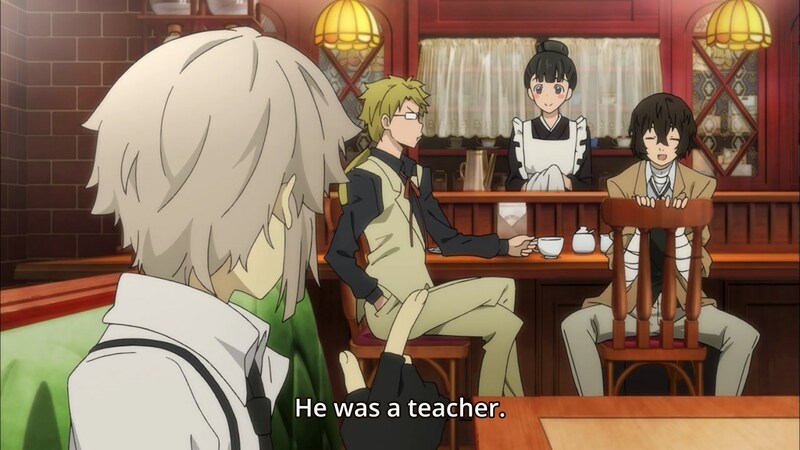 He’s finally a real character instead of just some random observer! 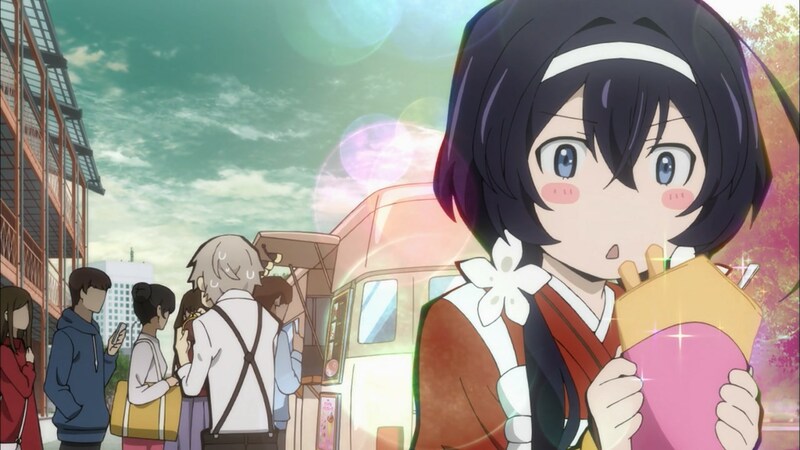 Honestly, this episode played out almost like a script…but hey, people like cute developments like Kyouka, right? 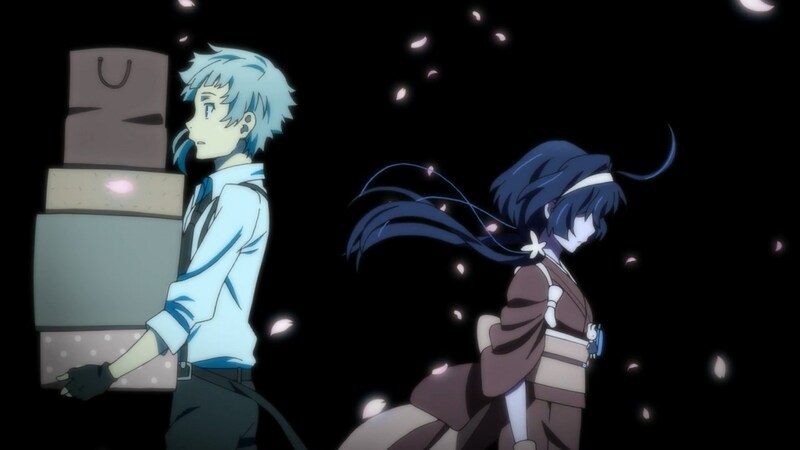 Next week episode looks to be mostly filler as Atsushi learns more about Kyouka…then they’ll probably have to save Dazai, right? Recap from last week: Azure Messenger set a bomb somewhere for the main characters to find. But yeah…what a respectful and polite terrorist! That’s such a kind letter that he left for them. 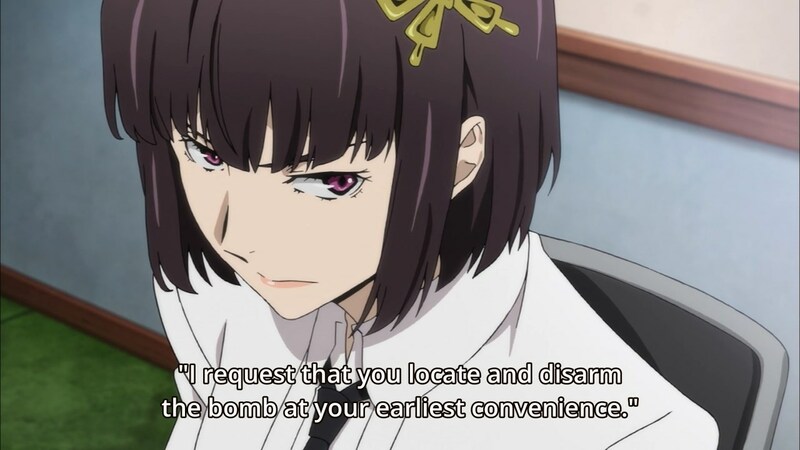 I think this line loosely translates to “well, we don’t mind if you shoot missiles at us, but if the Internet starts flaming us, we’re screwed”. Yeah, Doppa couldn’t possibly be his father! He doesn’t get a wife for another 6 years! Oops…that’s not how you spell that word. 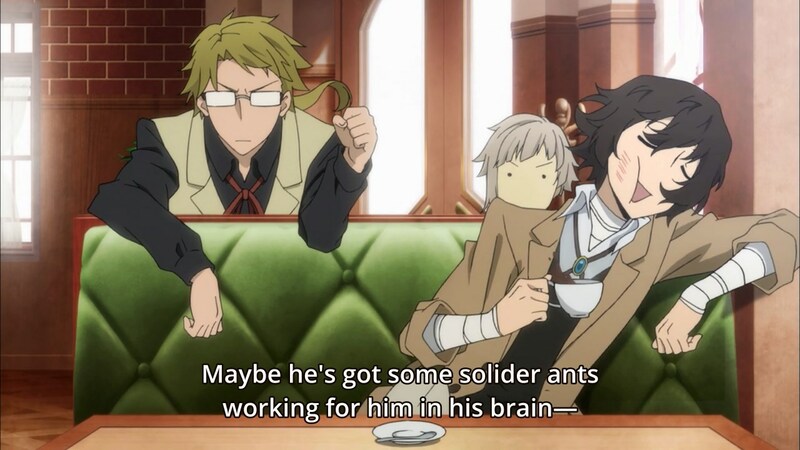 Unless you actually mean that the ants in his brain are more solid than…normal ants? 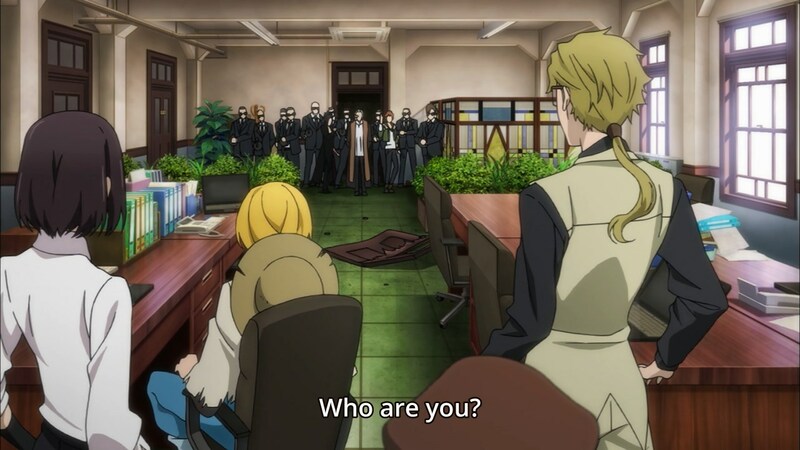 Maybe it’s the fact that I suspected Sasaki of being the culprit last week, but her knowledge of the Azure King seems really suspicious here. I know she was just introduced as a social psychologist, but it still feels too convenient. This is basically me in real life. 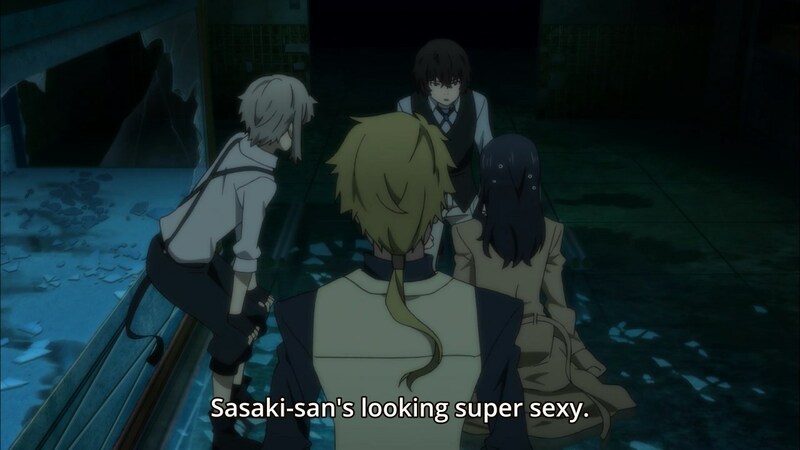 So judging by Dazai’s statements before this scene, Sasaki is looking at Doppa’s description of his ideal woman. 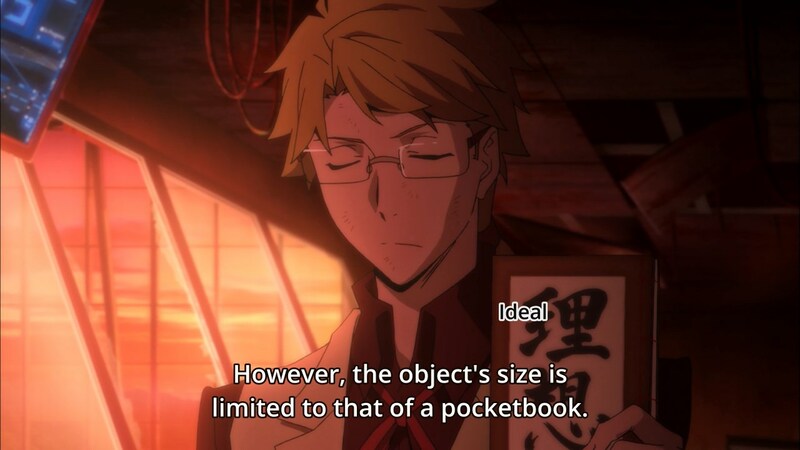 What I’m wondering is how she managed to open it to the correct page when Dazai handed the notebook to her closed. Does Doppa mark that page to review it every day? 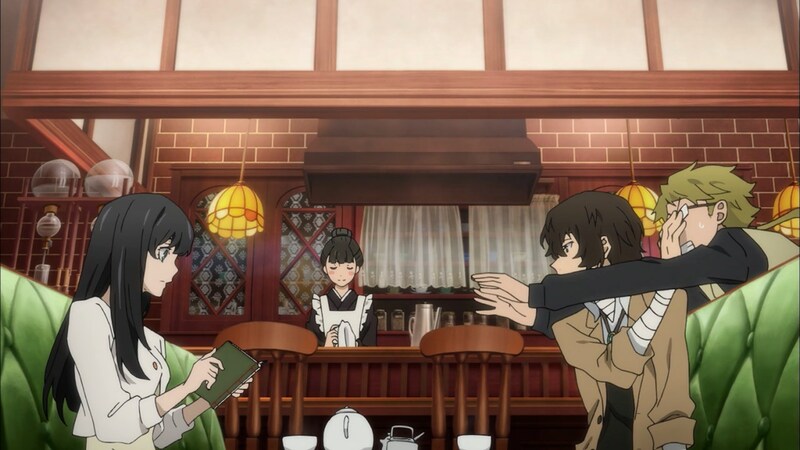 I understand that the point of these scenes is to show that Dazai is actually perceptive given how silly he acts, but I still hate every scene that involves both Dazai and Rampo. 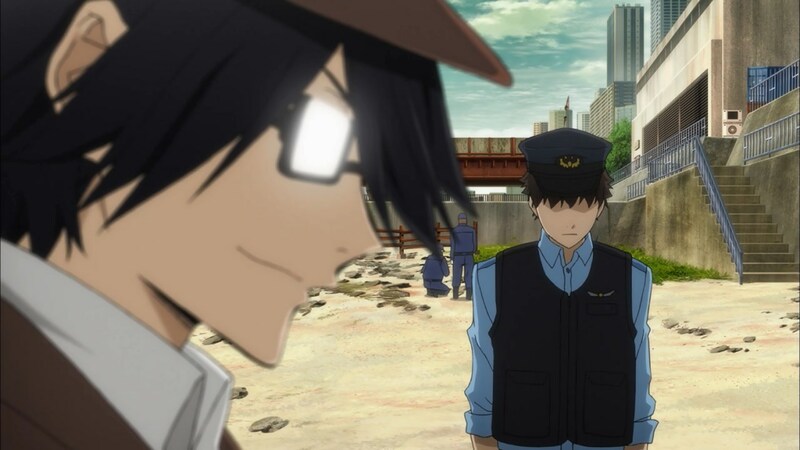 We get introduced to Rampo as this brilliant detective without a power and yet he always says the fewest lines to prove that. 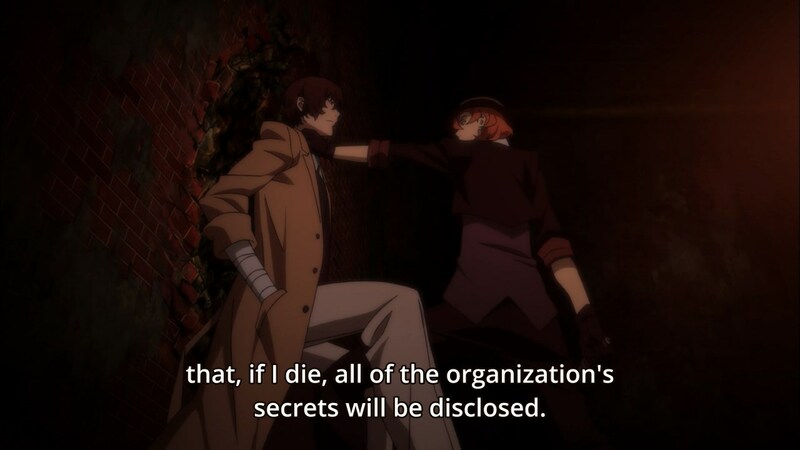 Instead, Dazai constantly steps in and explains things without any input from Rampo, begging the question of why they need Rampo to keep the Detective Agency alive in the first place. So what? The numbers are some sort of countdown or timer-related power that killed the driver because they weren’t refreshed by the user? 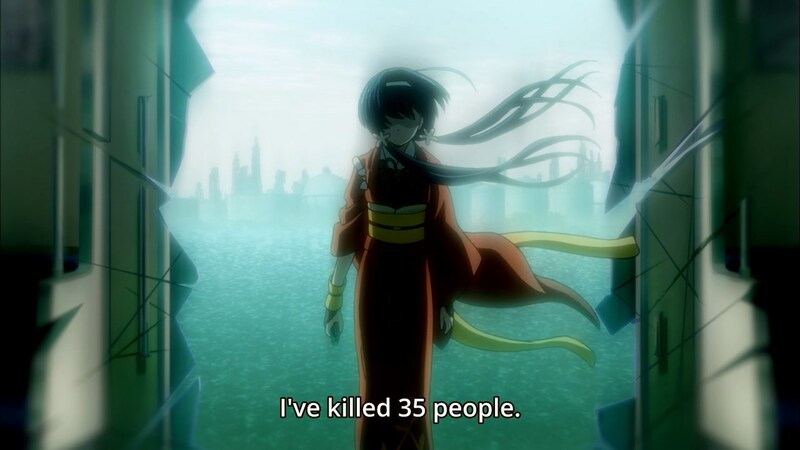 This guy places a random number on you and then arbitrarily drops it to zero to kill you? 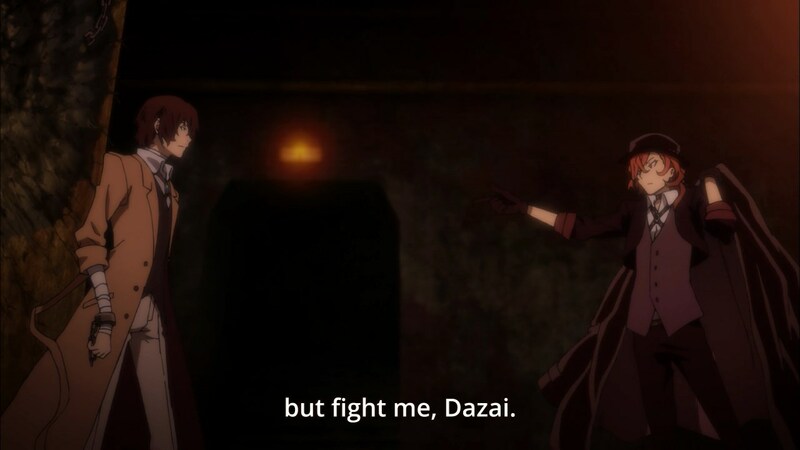 Sounds like Dazai’s the only one who can beat this power and he’s busy fighting the musclehead. That explains a lot. Does size just mean lateral dimensions? Because that wire gun seems like it has much more surface area and volume than a pocketbook. Who’s surprised by this? Just look at the shock on my face. I must admit, I had to think a bit when the hacker showed up because I wasn’t completely sure about him, but his explanation made too much sense. 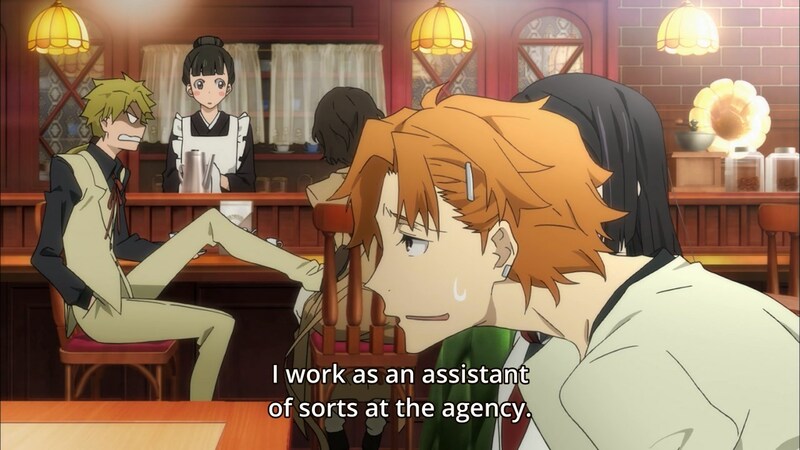 It’s hard to feel anything in this scene when you know that ridiculous healer exists in the Agency. I’m really having a hard time enjoying these episodes. Next week, a new story? This guy takes his diary really seriously. 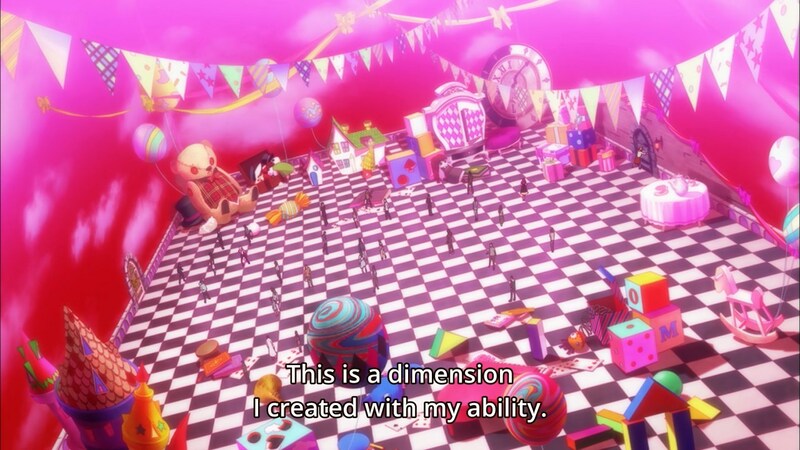 Anyway, despite how much screen time he’s had so far, I guess this week’s episode is focused on Doppo Poet. Is this pose even possible? Anyway, don’t do shrooms, kids. Four years before he starts finding a wife and he wants to marry his wife six years after the first date? How old is he going to be by then? Oh boy! A haunted house mystery! Okay, first of all, this girl in the water tank is immediately suspicious to me because she plays the damsel in the distress so early and gets saved too easily. Usually these people are trying to play the card in order to lead the investigators off the trail. 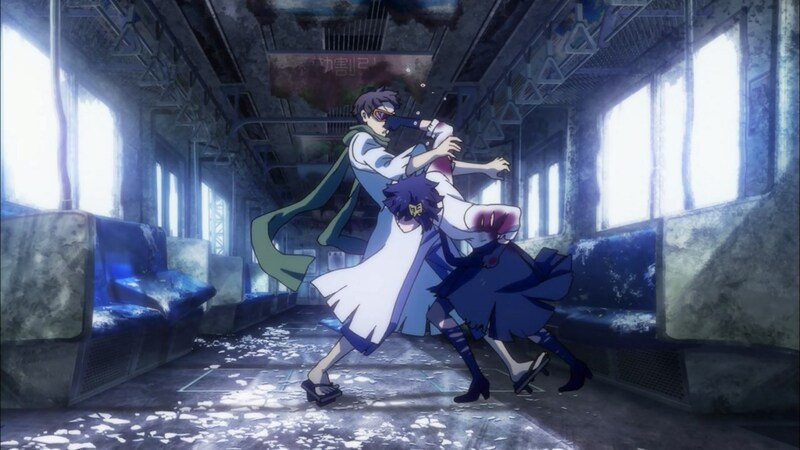 Secondly, I have a problem with how this scene is presented. 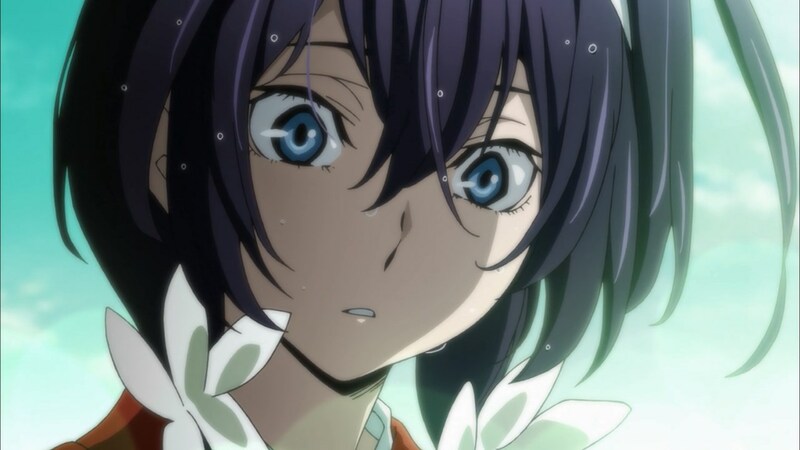 The screen fades to black as Doppo fires two gunshots at the tank and we come back later to see the girl outside of the shattered. Here’s my issue…the first gunshot definitely would have broken the glass, but instead of hearing the sound of shattering glass, we hear the second gunshot. 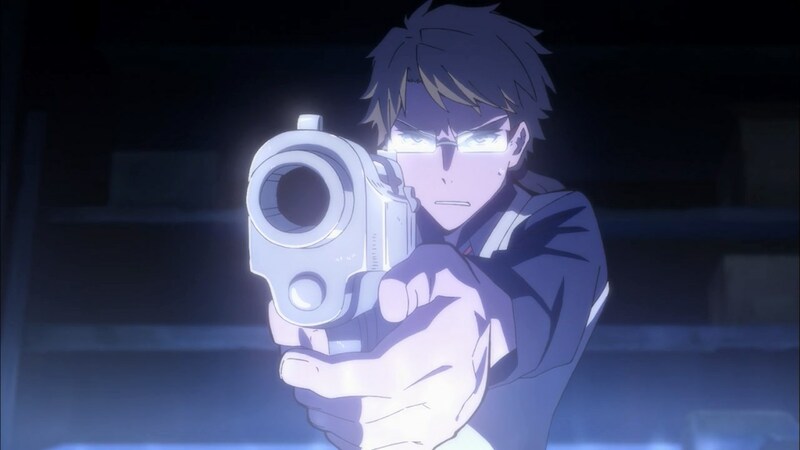 There’s no way he fires the second shot before the glass breaks, so it sounds to me like whoever was in charge of this scene decided it would be too much work to add in the sound of breaking glass or animating the scene at all. This man is a natural investigator. 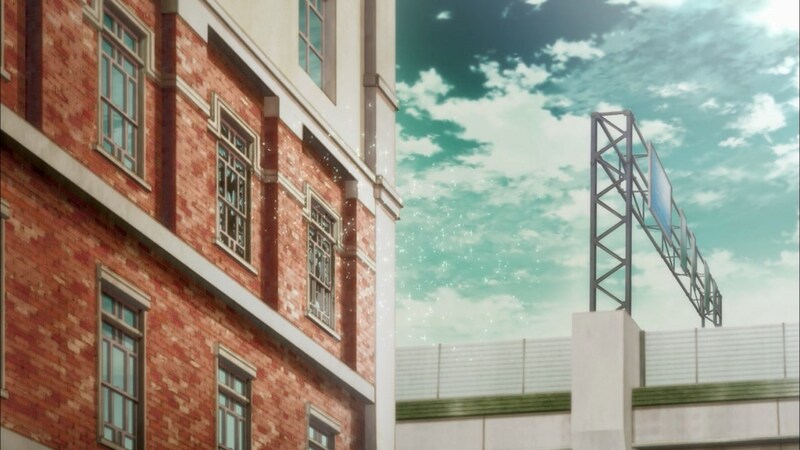 I’m guessing this camera pointed at Doppo indicates that he’s actually going to be the next target despite the jokes about the victims with glasses from earlier? Also, holy crap…a 5.5 TB drive on this camera? Wait…did the person on the other end of that camera send this photo to the newspaper? Why? Typical…he doesn’t tell anyone in the audience or the cast because there needs to be a dramatic reveal. Well, that’s no fun. This is the first episode of Sherlock all over again. Interesting…it looks like someone with influence put him up to this. 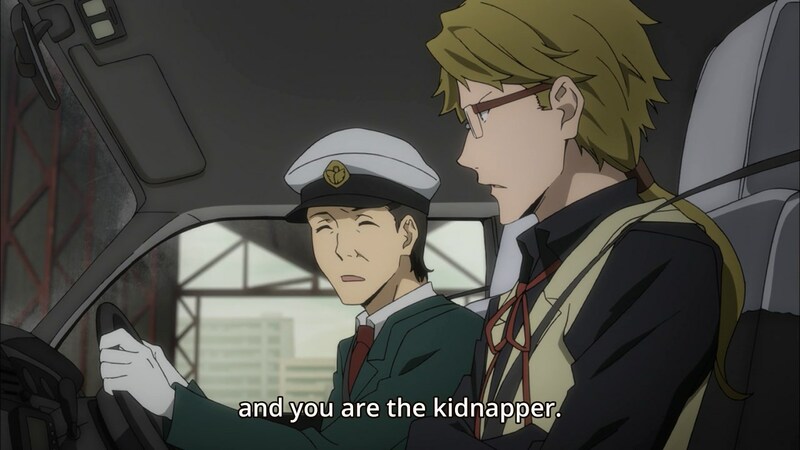 First off, these guys show up just as the taxi driver says that he kidnapped someone from the Port Mafia. 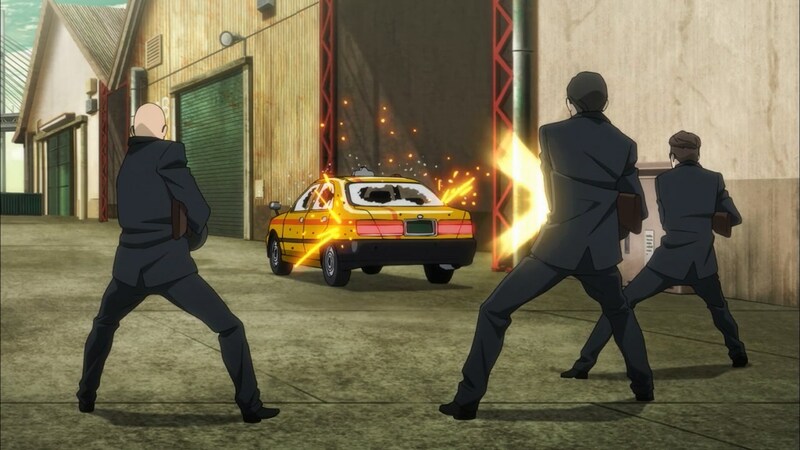 Secondly, they clearly have the jump on these guys trapped in the taxi, but still manage to miss everyone with AUTOMATIC WEAPONS. Good thing taxis are bulletproof! Everyone knows that! There was a mention of an “Azure Messenger” earlier too. 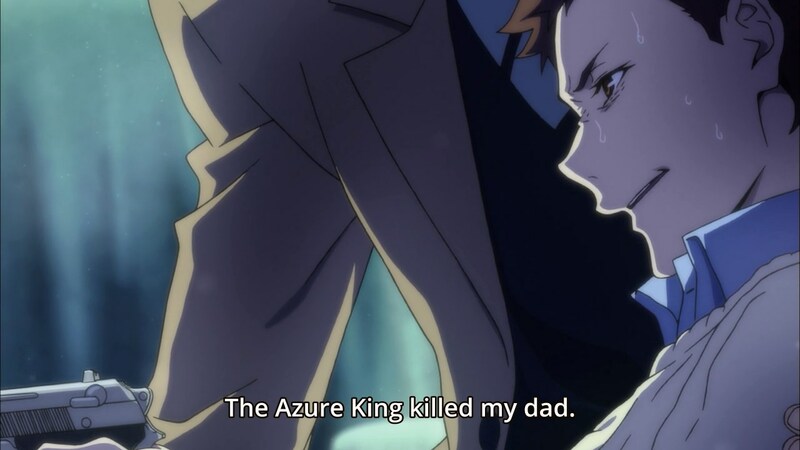 Now an Azure King? I’d be more invested in this revelation if I understood what these guys were supposed to be. 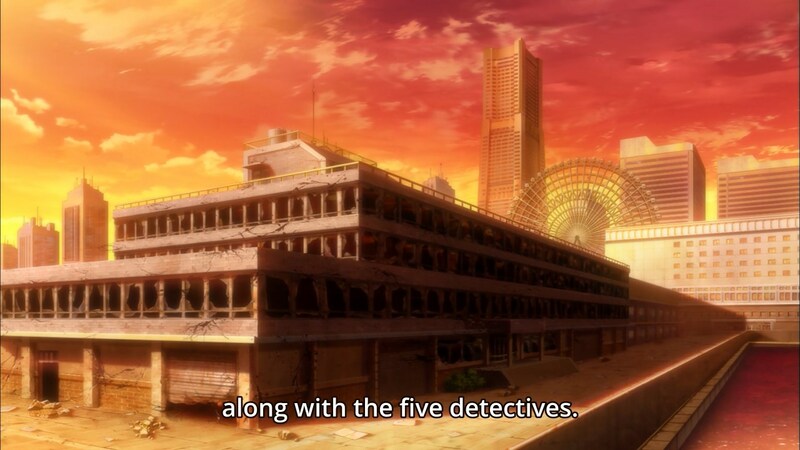 Well, it makes no sense to mention the five dead detectives unless they’re somehow related. 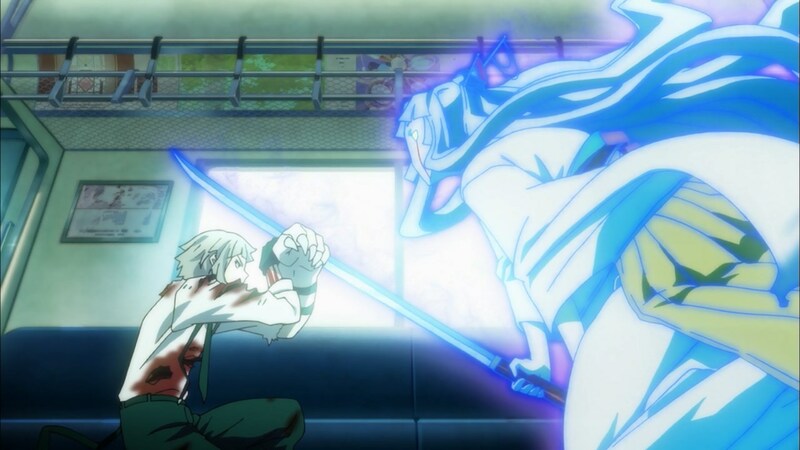 So either one of them survived or there’s a relative yearning to get some revenge. No problem! But yeah…something for next week. I’m sticking with my suspicion of the girl in the water tank. The preview continues to make her look suspicious. I might be jumping on the obvious suspect here, but that’s where my mind is going. In case you forgot how easy the battle was last week, here’s a reminder! Phrasing feels awkward to me here…I think the quality of the sentence goes up if you change “don’t have” to “don’t even have”. 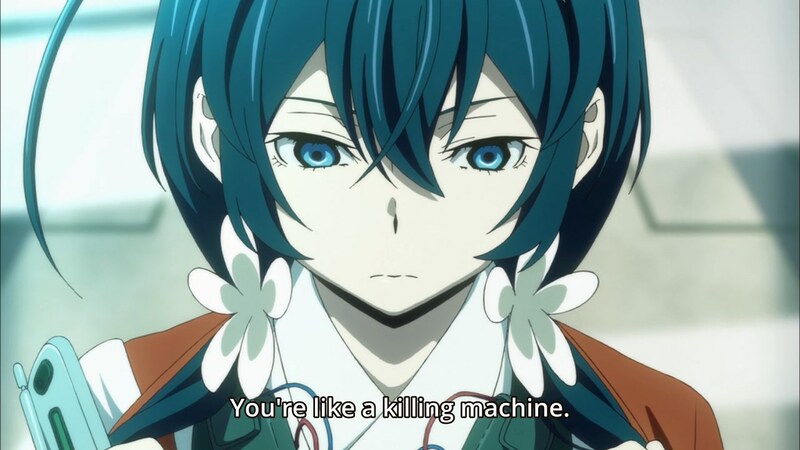 This insult also feels awkward. In normal circumstances, deductive reasoning is something that is built through experience, so it’s a legitimate insult. However, this guy relies on his power to give him the answers, which is hardly the same as having a knack for deduction. 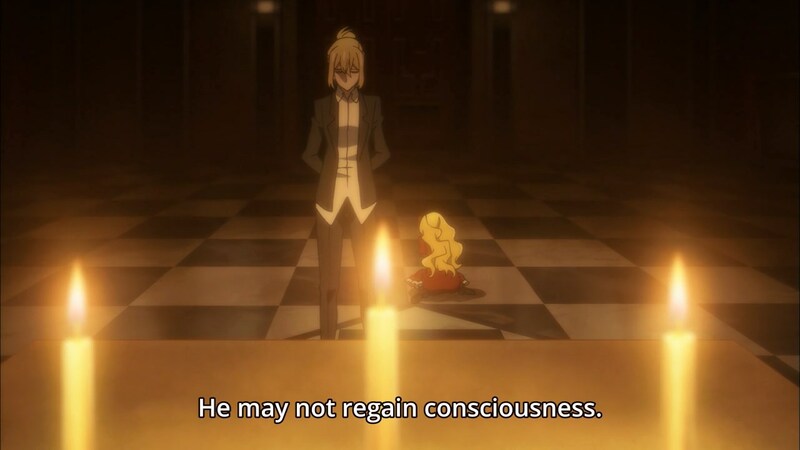 Also, at what point does having strong deductive tendencies cross into the realm of having a power? How do they even tell the difference? 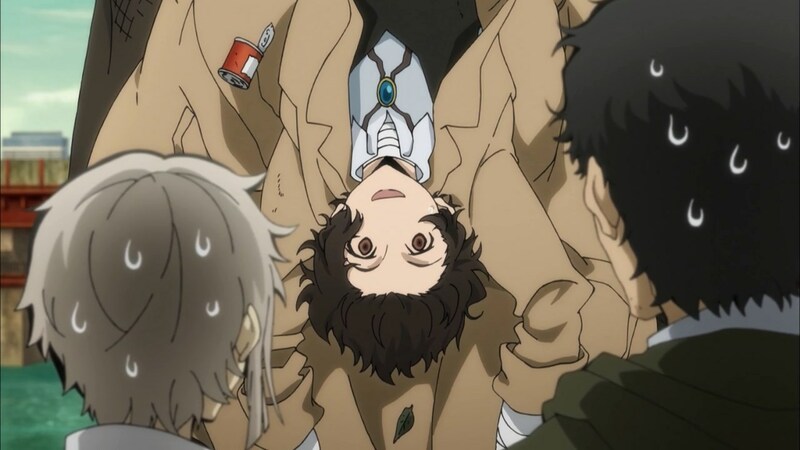 I suppose Dazai could try to hold on to him and see whether he still can figure things out or something? 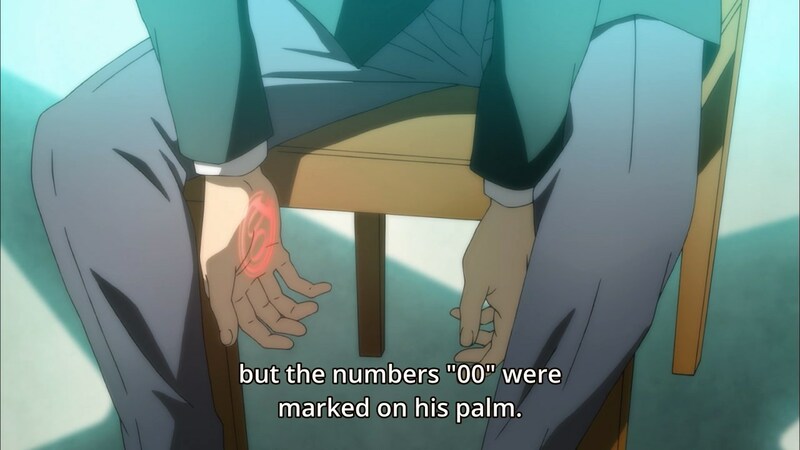 You can’t just deduce it? Also, “smart guy has no common sense” cliche. Ahh…water. Everyone loves using to wash away evidence. 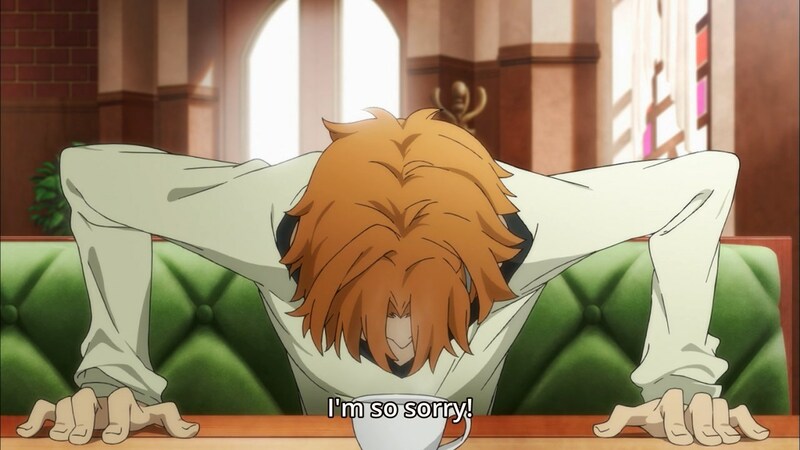 Judging by the dramatic music and the slow reveal, I’m going to guess this is Dazai trying to drown himself in the river. 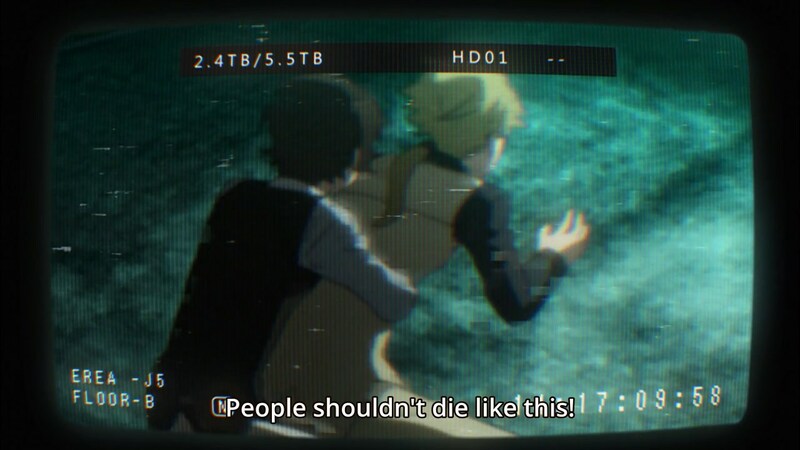 I don’t understand why Dazai enjoys drowning himself so much. 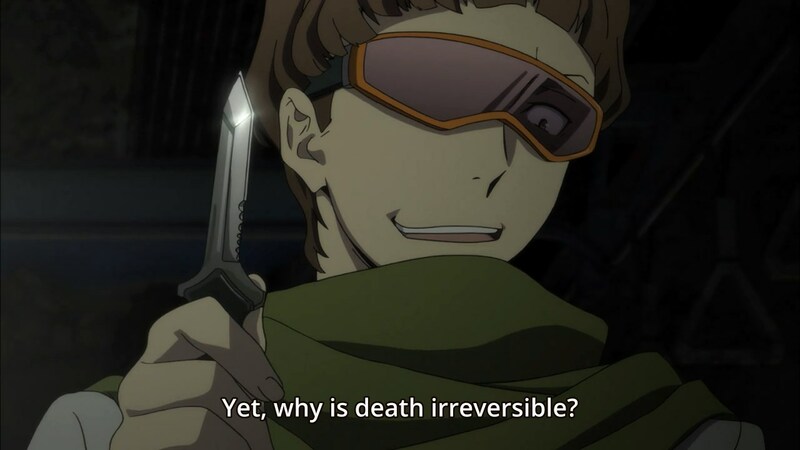 Isn’t that one of more painful ways to die? 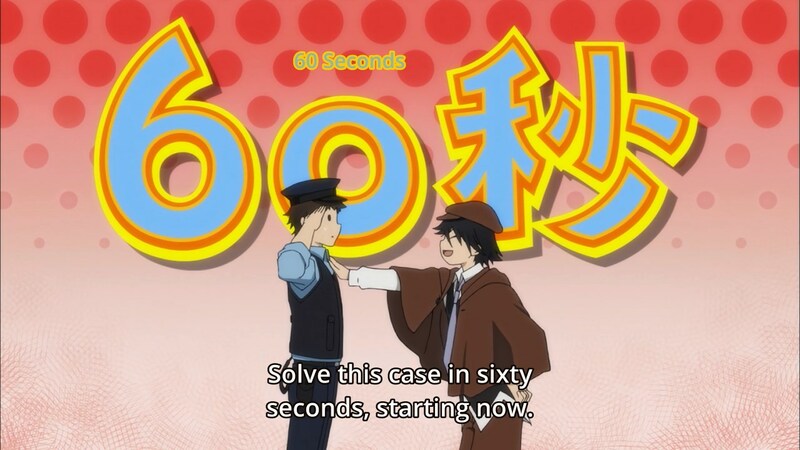 I’m assuming this means Rampo has already solved the case in sixty seconds. 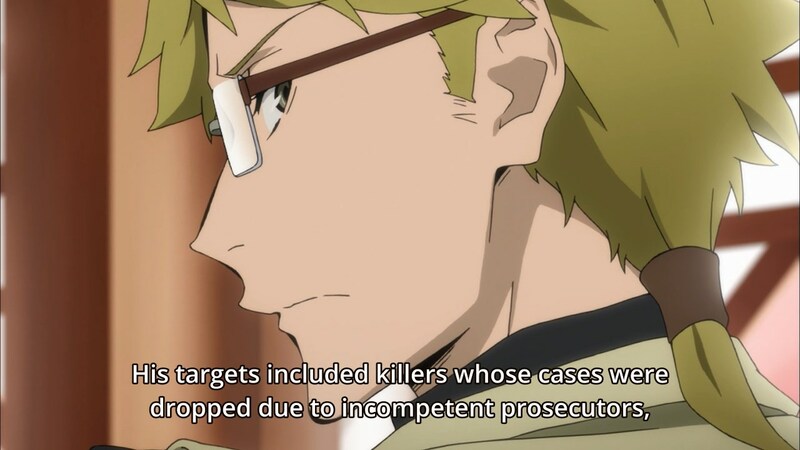 I’m guessing this is wrong because Rampo probably didn’t know what the victim was investigating prior to death. Okay, so the three shots to the chest are just meant to copy the Mafia’s killing style. 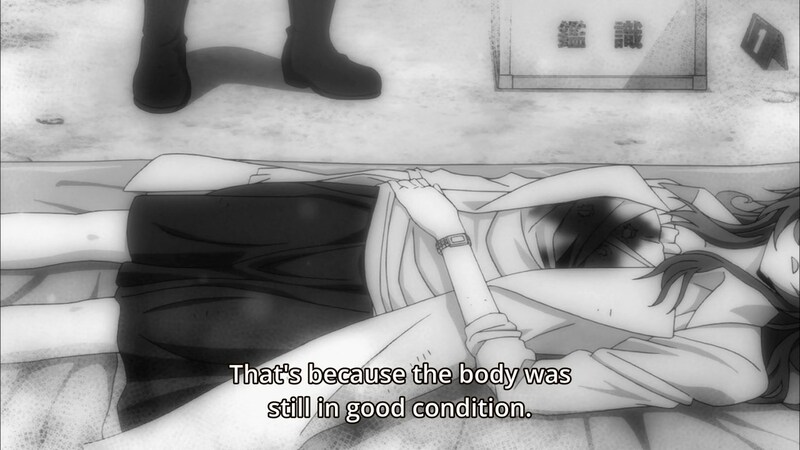 That means that the cause of death is actually something else…maybe strangulation or poison? 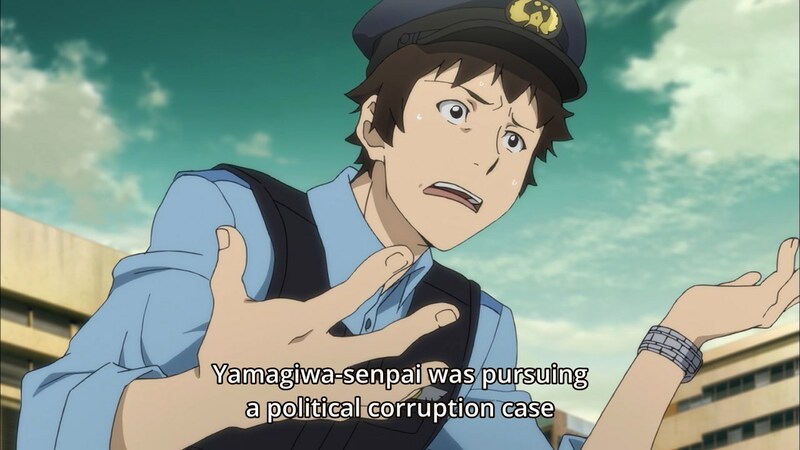 Uhh…maybe I’ve been watching too many cop shows, but usually when someone copies another person’s killing style, it’s to cover up a completely different type of murder. 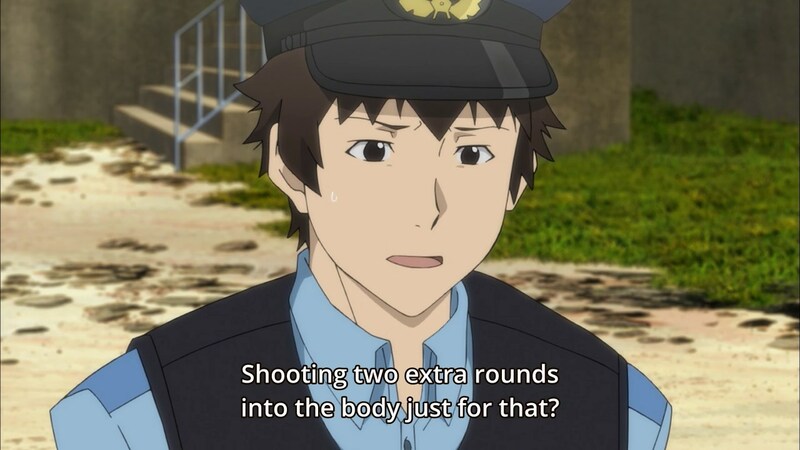 Is this guy assuming that the original cause of death was a single gunshot? How did he know that the cause of death wasn’t two gunshots and the third was the cover up if you’re going to go down that line of thinking. 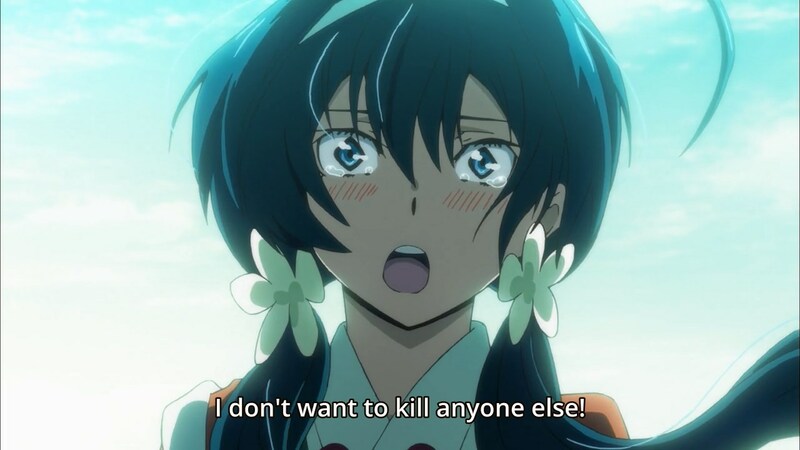 A bit overly dramatic, don’t you think? 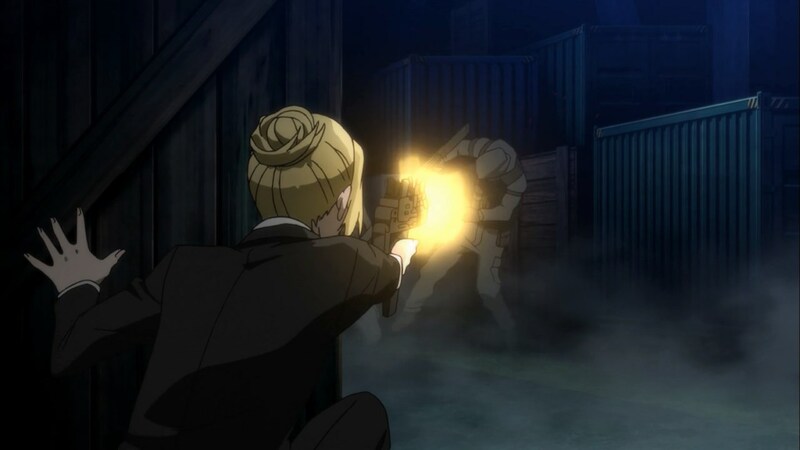 I can’t believe she points the gun towards her instead of trying to point it at the sky. Plus, just how much to blame is this guy for the murder? Oh, so it’s not a power after all. 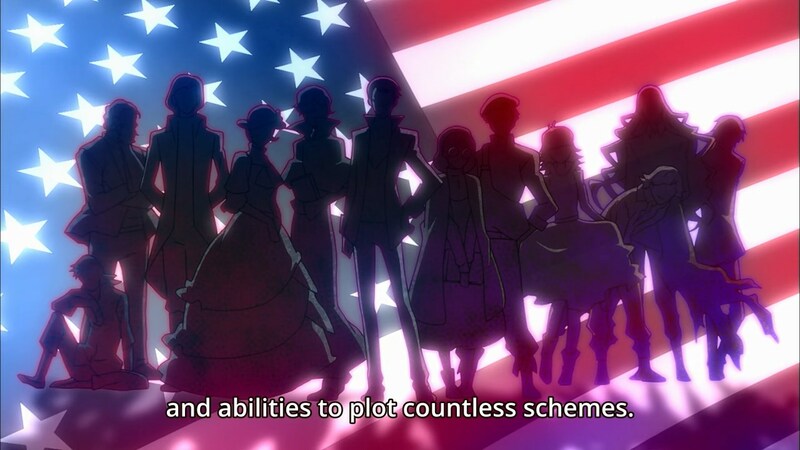 I actually like this reveal…Ultra Deduction sounded like an awkward power to explain. I can’t tell what this final scene is trying to do. 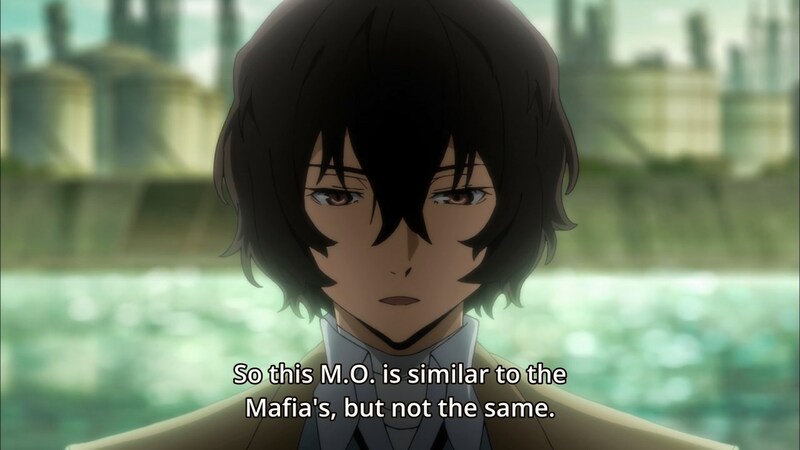 Dazai tries to explain what a genius Rampo is without an ability, but he deduces the major issues of the case without a deductive power of his own. 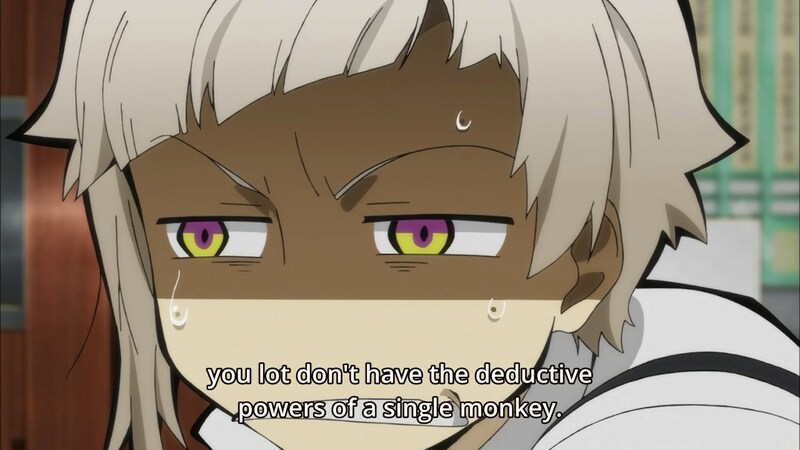 Doesn’t this make Rampo’s deductive abilities seem less useful? 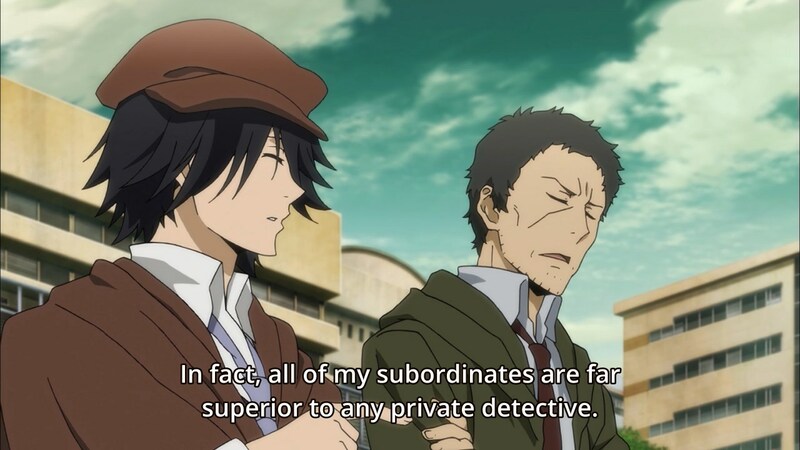 Why is he the only detective in the agency if Dazai can do the same things? 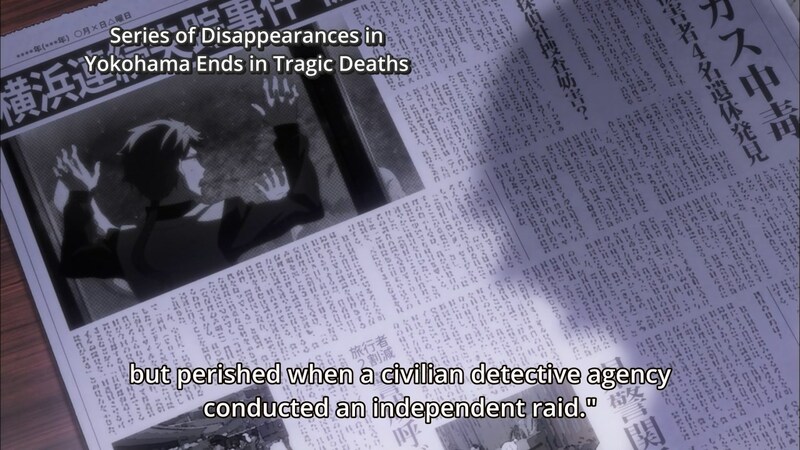 The only things Dazai credits to Rampo’s skills are the knowledge of the murder location (which I assume involves knowing what’s upstream, having a rough estimate of how far the body traveled, and having an idea of what abandoned place would be a good meet spot) and the knowledge that the victim was threatened by a gun (which is useful…why?). 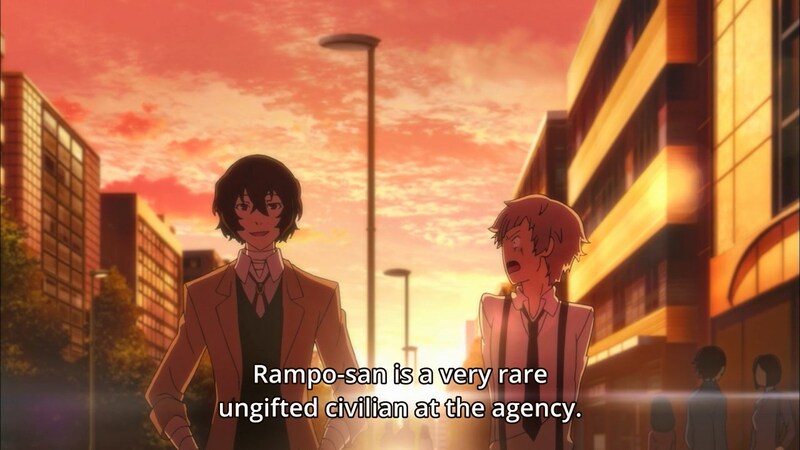 This hardly qualifies Rampo as a genius unless Dazai also qualifies. 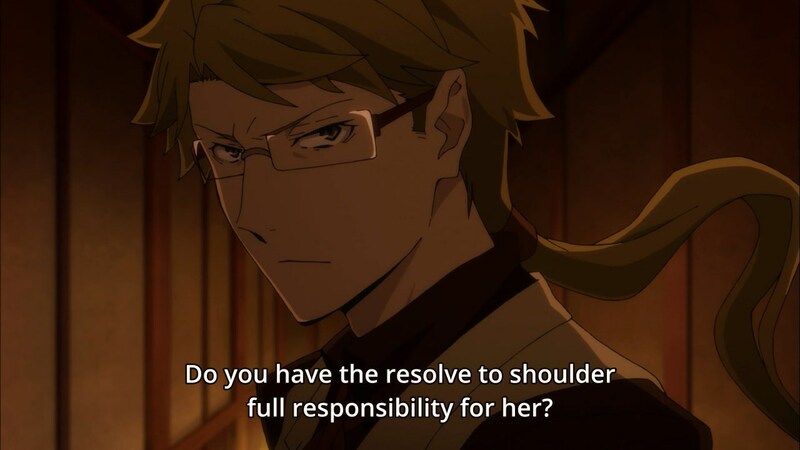 Bungou Stray Dogs Episode 4: Can we just skip this episode? Your sin is your very existence! Where have I seen this before? 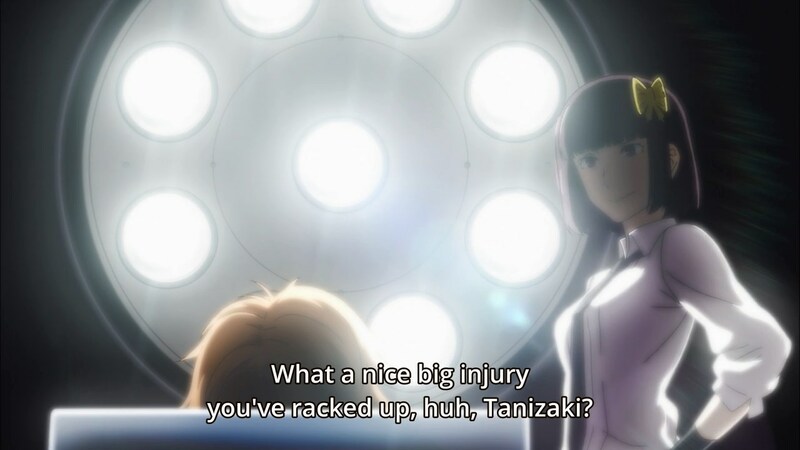 I get the hospital bed thing and all, but do we really need to be shown scenes from last week’s episode to be reminded about what happens? 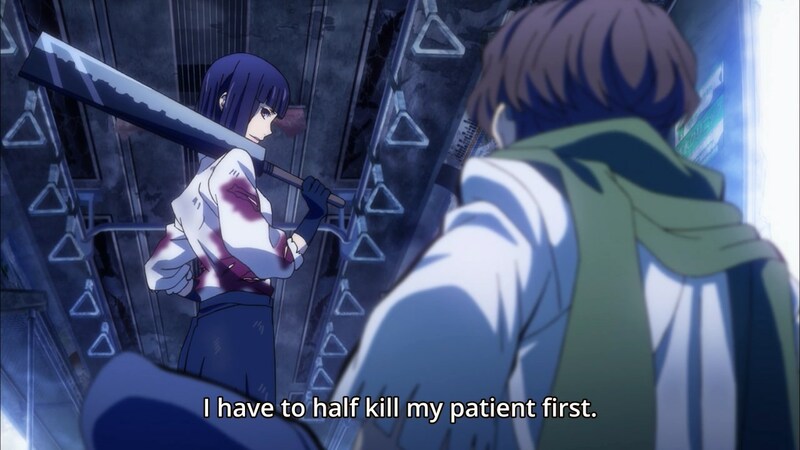 Every series needs that overpowered healer that makes you question whether the main characters are even in any danger at all…right? 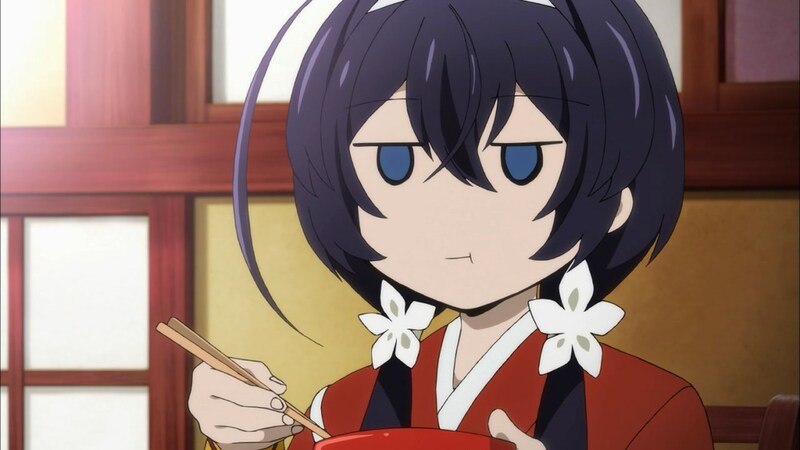 This looks like a useful reaction face. 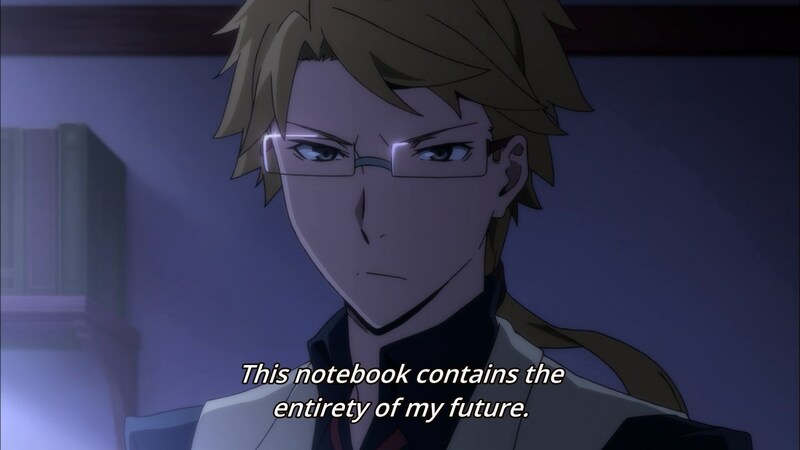 Also, not a bad joke to show his panic through his notebook. 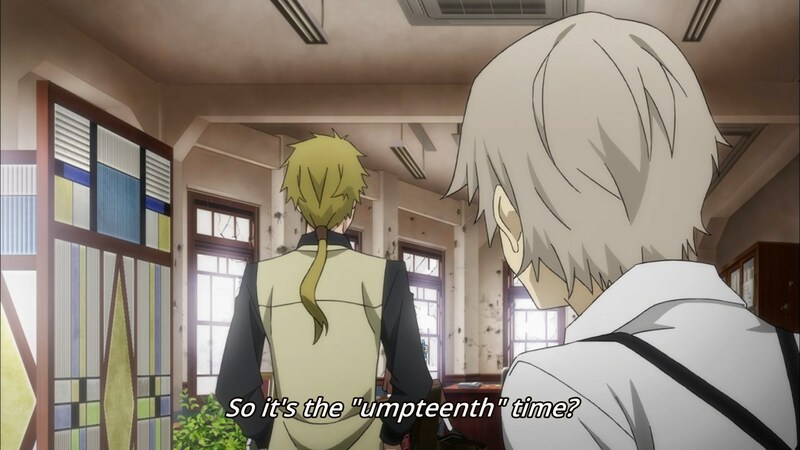 I’m tempted to say that this is taking the joke too far, but they didn’t show Atsushi’s reaction, so I’m willing to give it a pass. 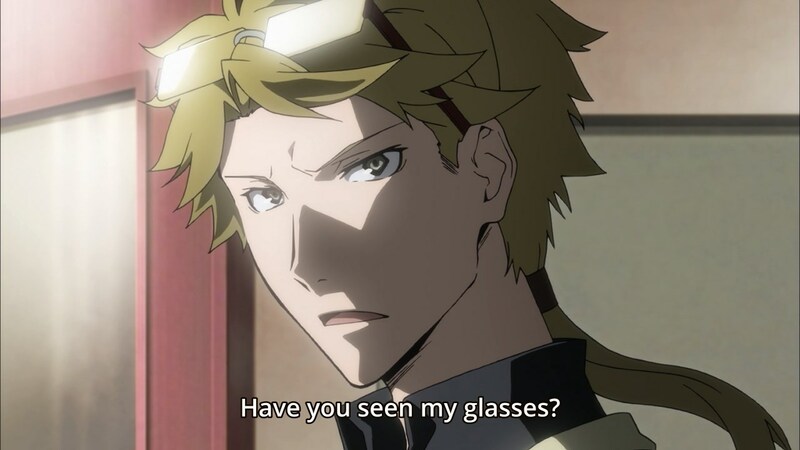 I’m asking the same thing, buddy. I’m guessing he’s the distraction for the group this week. Where’s this blood coming from? 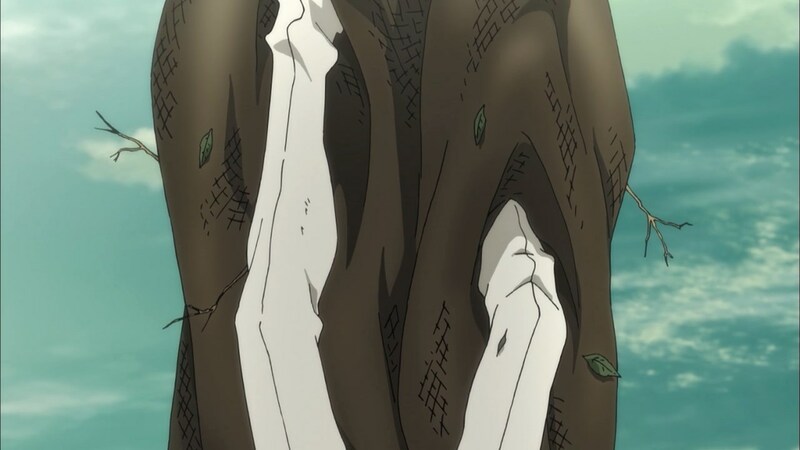 I would have expected internal bleeding from his wounds, but maybe that’s just me. 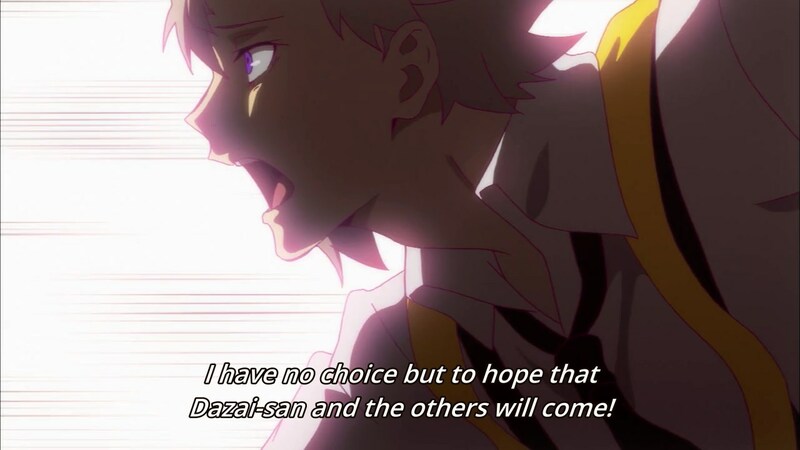 Let me guess…this is the “I must leave to protect everyone” cliche. 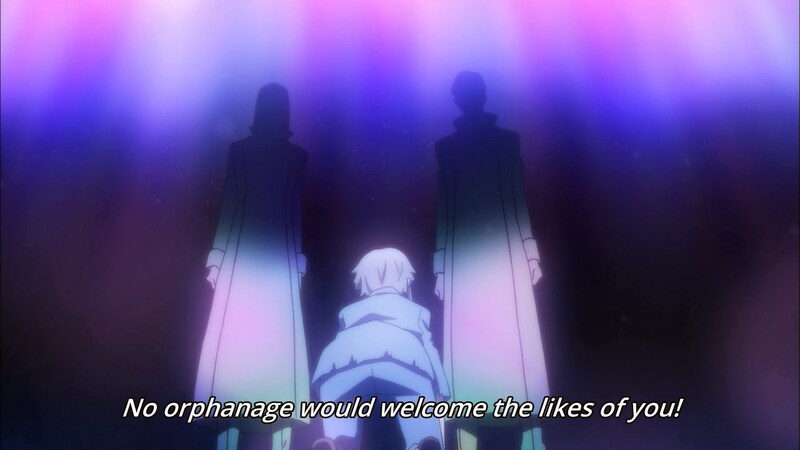 Just in case you forgot, here’s the weekly reminder that the orphanage hated him. Wheeeeee! Surprise, surprise! 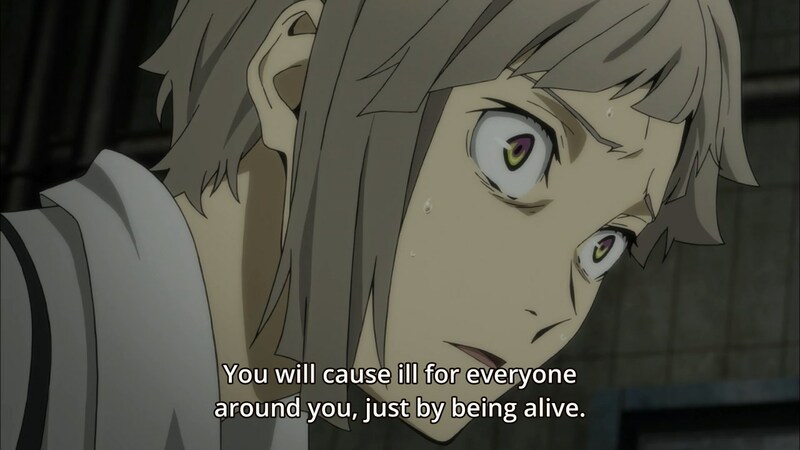 Atsushi’s plan doesn’t do anything. 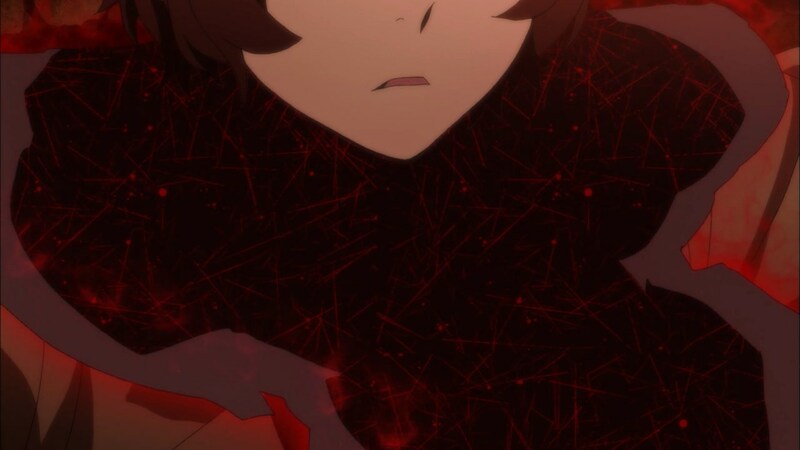 Judging by the transition that happens after this scene, I’m guessing this is a past version of Dazai? 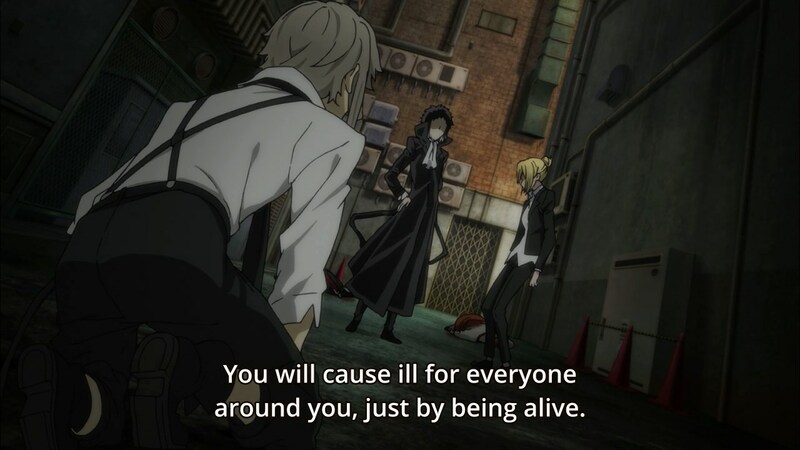 It certainly fits Akutagawa’s words about wanting to die. This window breaks, but no gunshots come out…are the gunshots just not making it to the window or is this lazy animation? 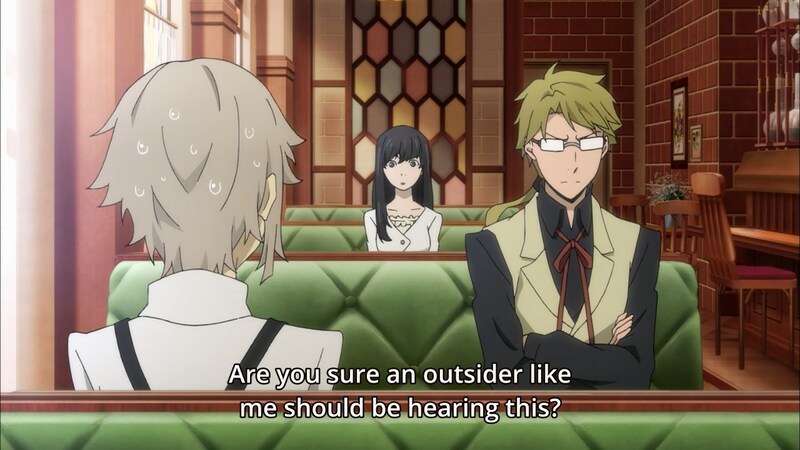 I get that this is supposed to be a comedic reveal to illustrate that Atsushi worries too much, but wouldn’t it have been much more interesting to watch them fight the mafia guys than watch Atsushi out on the street moping? If there’s no flashback to the fight, I’m going to be upset. 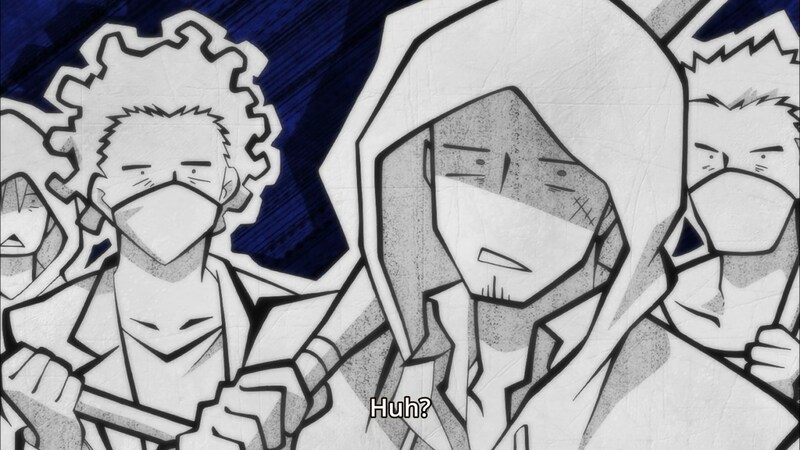 Anyway, this week’s episode was really underwhelming. I was pretty bored and the main action sequence didn’t even happen on-screen. 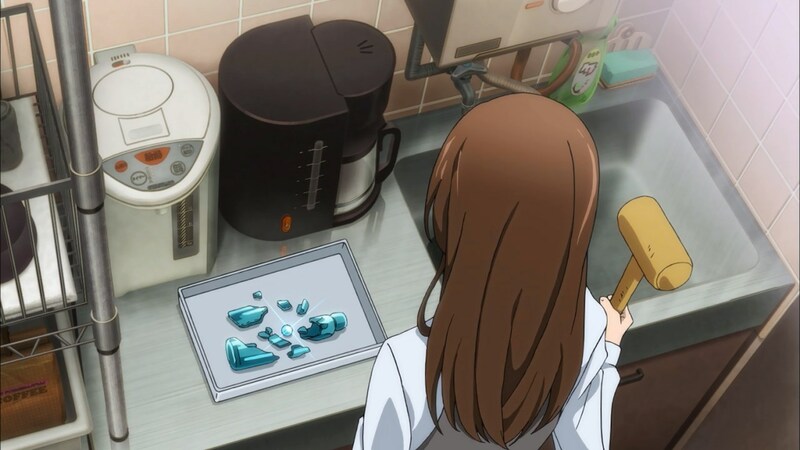 It looks like next week will introduce another power…and randomly change the series into a mystery series temporarily. 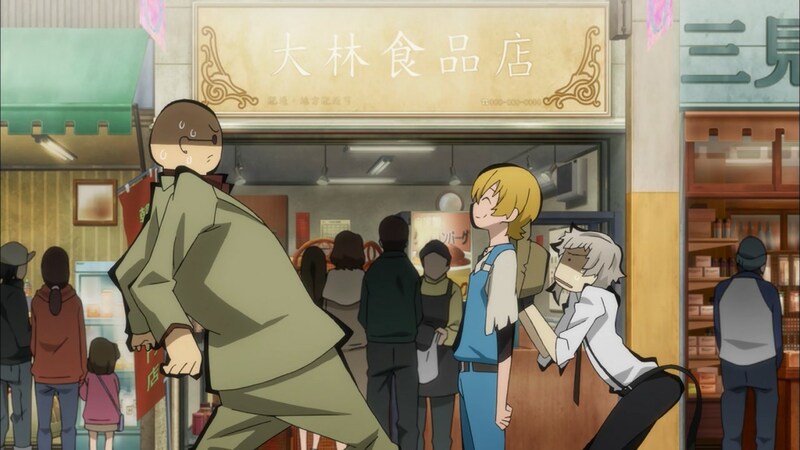 Author marthaurionPosted on April 28, 2016 Categories Bungou Stray DogsTags supernatural powers5 Comments on Bungou Stray Dogs Episode 4: Can we just skip this episode? 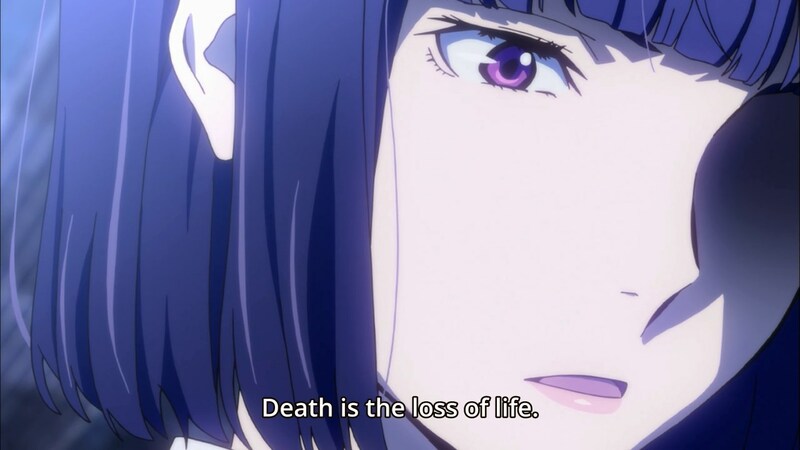 I feel like this image will be useful in the future. I’m so distracted by what’s going on in the background. What is this guy saying? He’s got a different personality than what he was displaying last week? They said last week that this guy has a power, right? And he’s only an assistant? 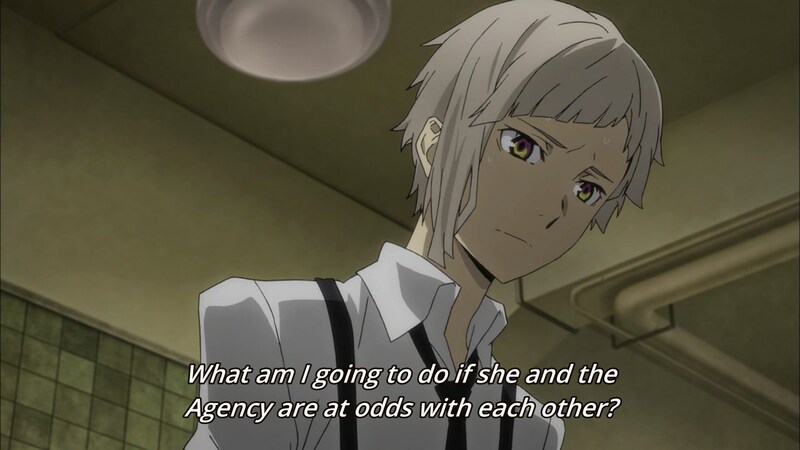 Does that mean Atsushi will also be an assistant or is he a full-fledged member? I’m going to get tired of this eventually…but I’m fine with it now. The school girl clearly wearing a school girl uniform was a school girl? No way! So…basically saying it’s safe to assume anyone under 18 is a student. He’s not wrong, but still…look at yourself, man. Oh right…I forgot this guy is poor. Anyway, if it were me, I would guess something silly…like “unemployed”. 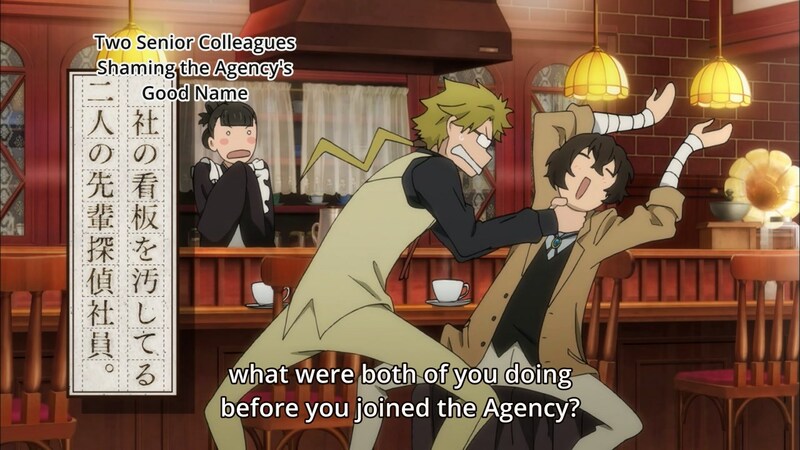 But yeah, mostly likely Dazai’s previous profession was something really important or just assassin. 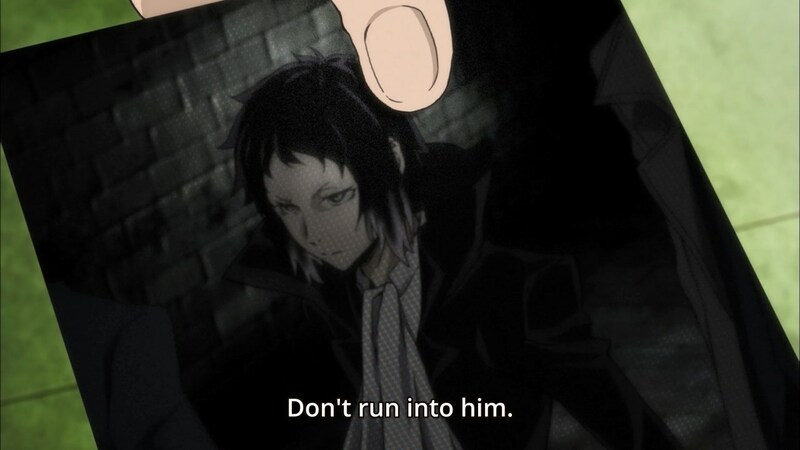 The fact that he shows Atsushi the photo means that he will likely run into this mystery man during the mission (despite it being a “simple one”). I have problems with the way this scene played out. 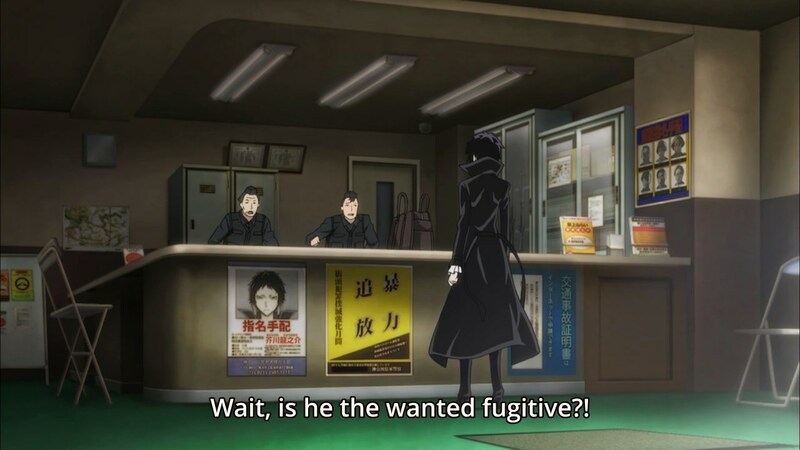 First off, this reaction of “is he the wanted fugitive?”. 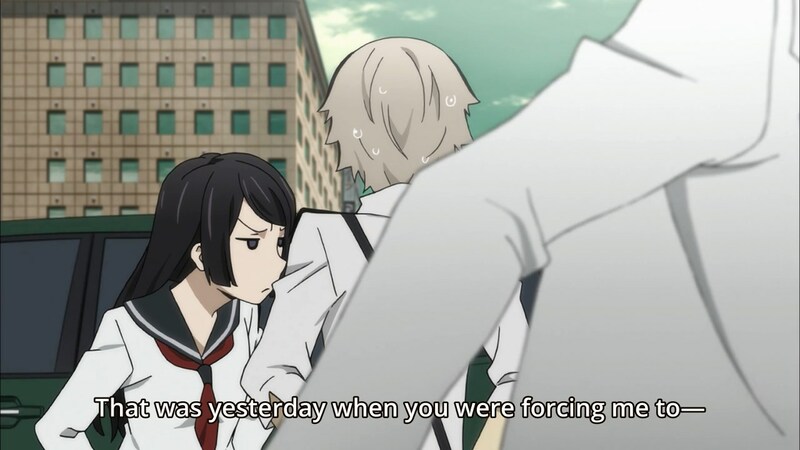 I’m guessing the guy just happened to remember it from seeing his face before, but the timing makes it seem like Akutagawa refreshed his memory by saying he was “found out already”. 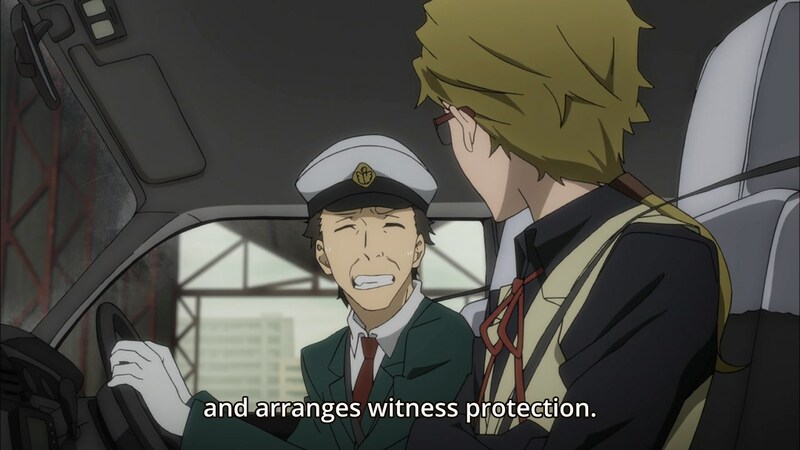 Also, Akutagawa walks in to the police station with a post of him sitting right there on the front of the counter and praises them for figuring out who he is? Is it really that impressive? 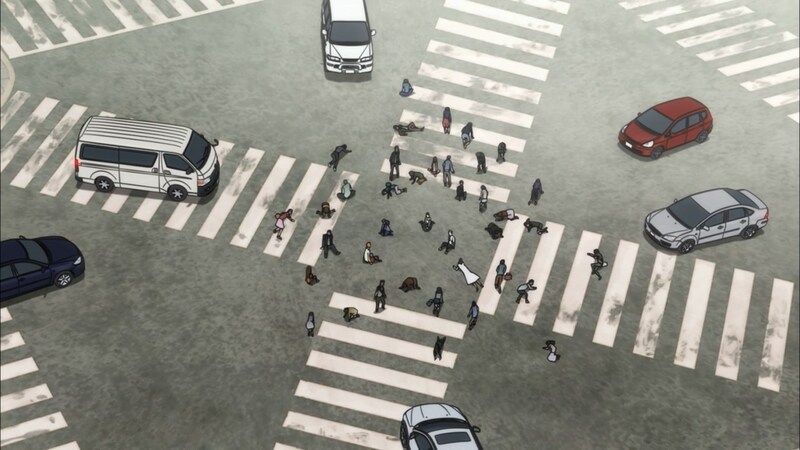 Oh gee…I wonder if this girl is going to find the officers dead and scream while the scene fades to black. Close enough. 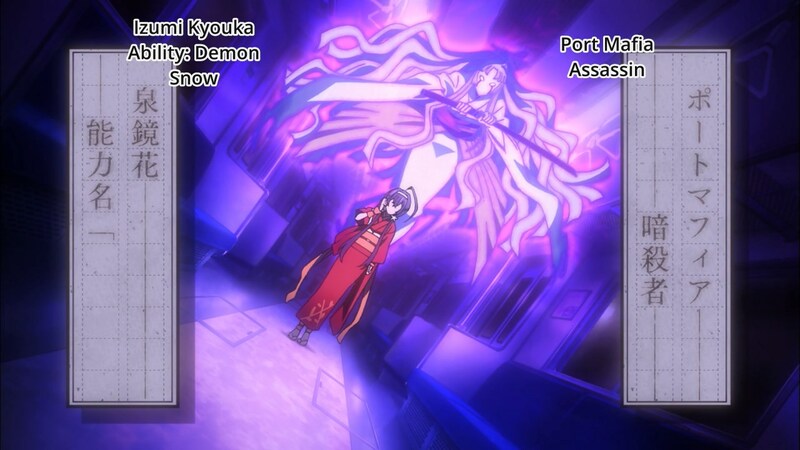 Also, what kind of power is Rashoumon? Sounds like a Digimon. Follow me into the dark, empty alley, kids! I have candy! Wow, I legitimately didn’t see that coming. 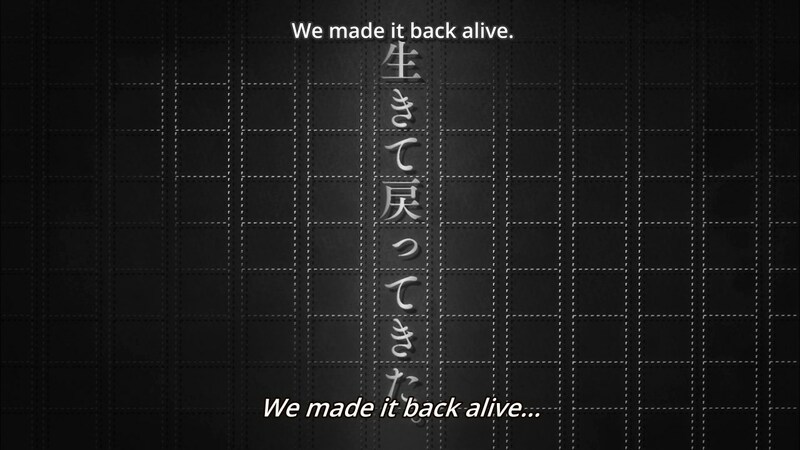 Time for the show to reveal exactly what kind of show it is. 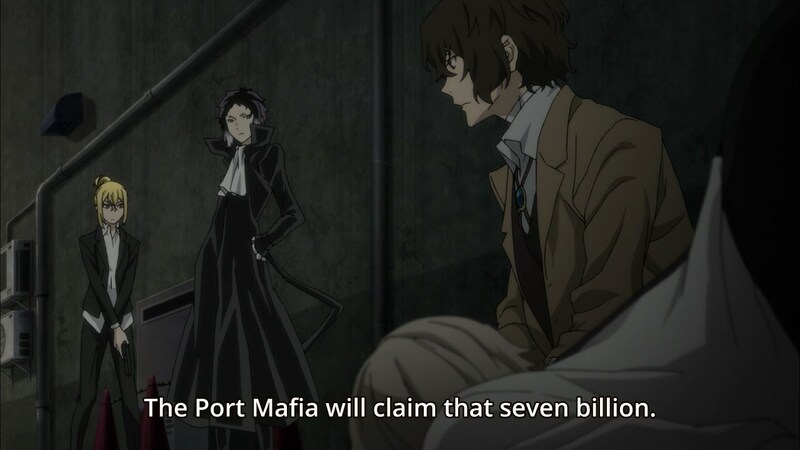 I was honestly expecting the mafia lady to miss for some stupid anime reason. 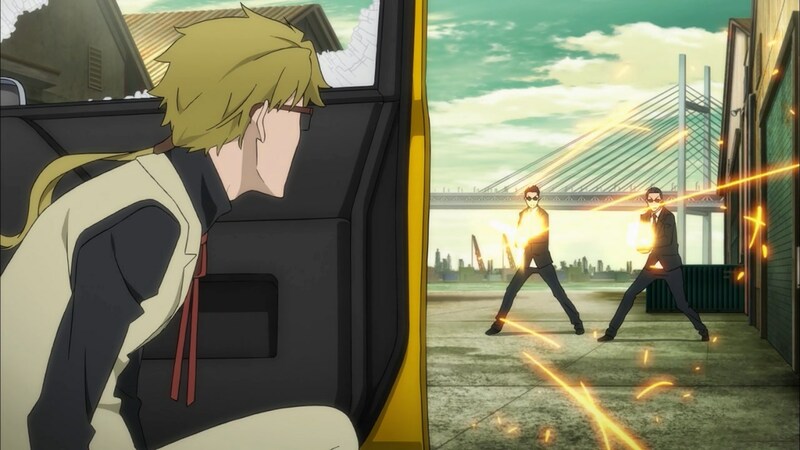 Then again, this is a series with supernatural powers, so…reverse time? Resurrection? Is this the “join us because you cause suffering” speech? Cool-looking ability, but the description is a bit vague. Is Rashoumon some mythical beast from Japanese lore that I’m supposed to know about? 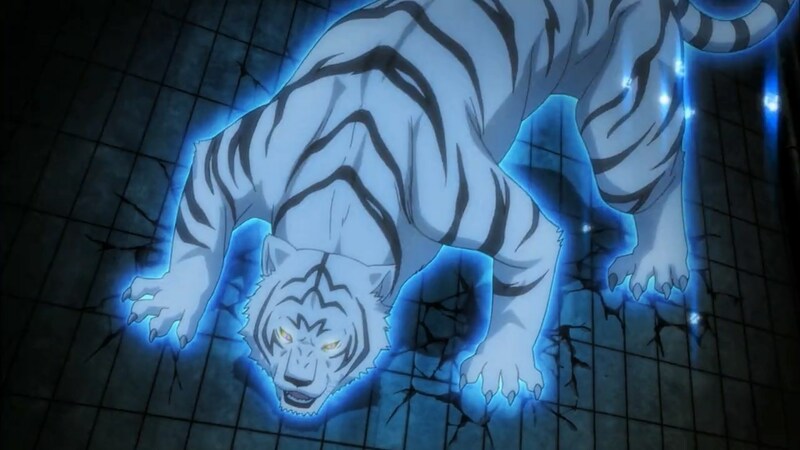 Or is he the generic “stronger than all things” creature for this series? 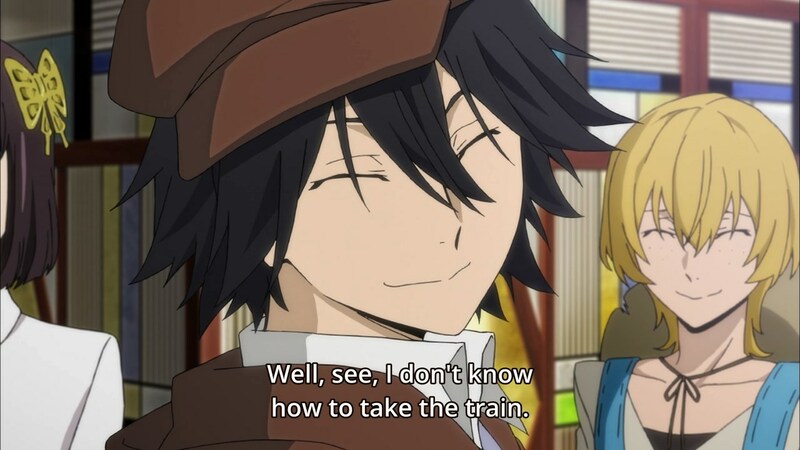 So he’s not useless after all! Also, I should ignore the obvious “red vs. blue” signs, right? We did it for the money! 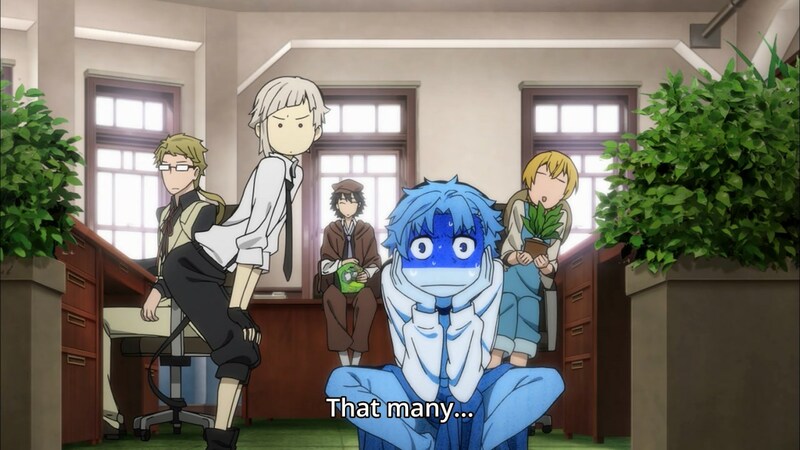 I’d be more interested in who would put out a bounty like that on Atsushi. There’s hope for this series, right? 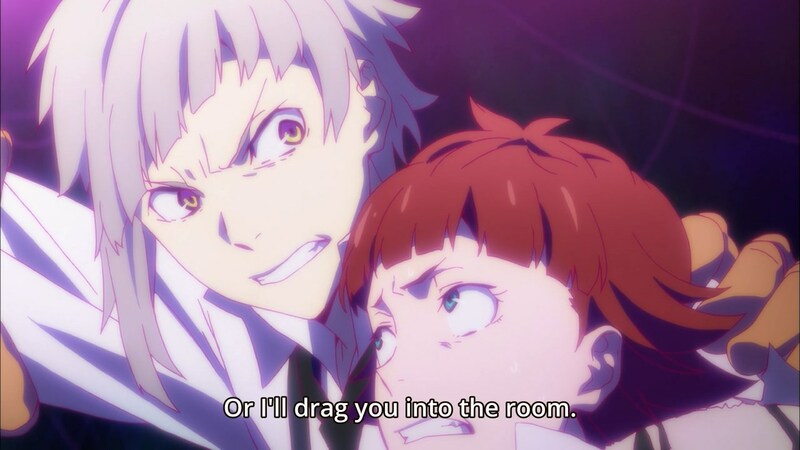 Atsushi can be useful!